Submit your stories to the blog! Email Scott at [email protected]. Posted 9-25-18: The invasion of Round Goby eastward through the Barge Canal towards the Hudson River has been slower than anticipated. An angler captured a specimen in 2014 near Utica but no specimens have been reported east of Sylvan Beach (east end of Oneida Lake) since that time. However, environmental DNA (eDNA) samples collected by the USGS have consistently indicated the presence of round goby DNA near Utica. Periodic trawling, seining, and trapping efforts at this location have failed to capture goby, however. On Friday 9/21, Scott George and staff from the NYS Museum Ichthyology lab back-pack electrofished sections of the Barge Canal and natural Mohawk channel in the Utica area to learn more about the distribution of Round Goby. 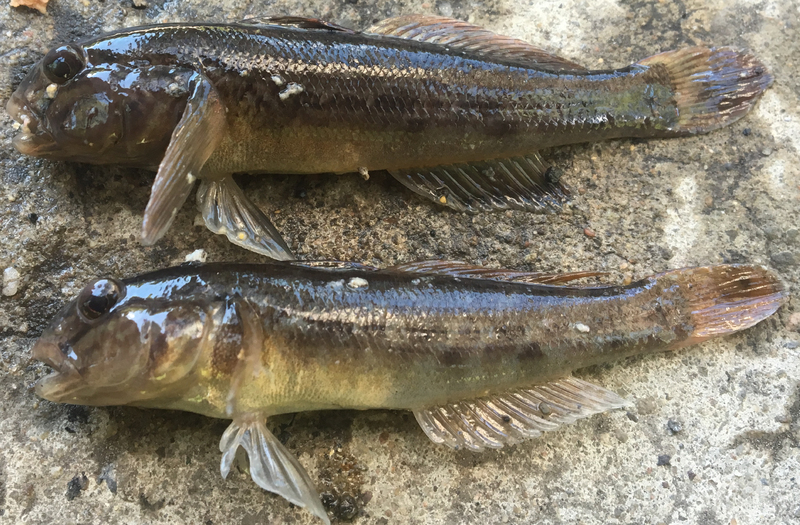 Goby were captured at two locations that have been reported to the Nonindigenous Aquatic Species (NAS) database: https://nas.er.usgs.gov/viewer/omap.aspx?SpeciesID=713. 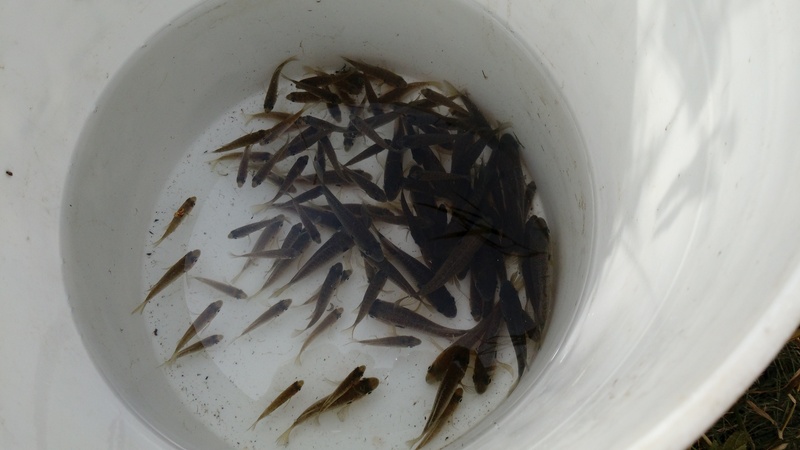 Goby dominated the catch at lock 20 on the Barge Canal (just west of Utica) with many young-of-the-year and adults present. 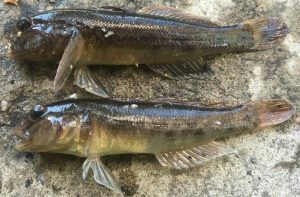 A single goby was also captured on the natural Mohawk River channel immediately adjacent to lock 20 near Rt 291. The natural river channel supports a robust darter community likely to be adversely affected by goby invasion. 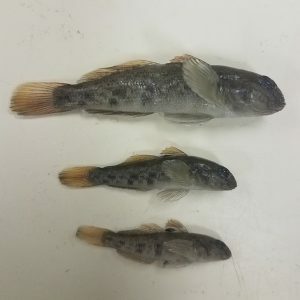 These captures suggest that round goby are slowly expanding their distribution and abundance in the Mohawk River Basin and additional expansion should be expected in the near future. Posted 9-12-18: Introducing shadia the first R package for modeling American shad populations! 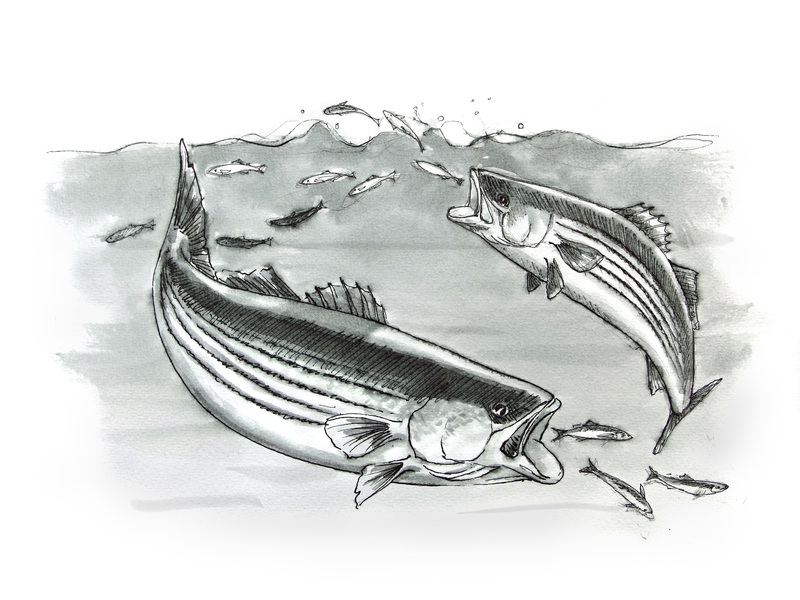 The new R package allows users to run dam passage performance standards models for American shad in northeast Atlantic Coastal Rivers (Connecticut, Merrimack, Penobscot, and Susquehanna rivers currently). The models combine classical cohort-based projection models for annual vital rates with an individual-based migration model using a recently published approach. 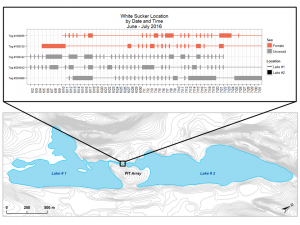 Users can specify upstream and downstream passage effectiveness, and timeliness of passage, at dams to predict population responses to different management strategies, fishery harvest rates and more, all over a user-specified time-frame. New features, updates, and patches are released regularly based largely on fishery management needs. The most recent version, including installation instructions, is always available on GitHub: https://github.com/danStich/shadia. Don’t see your favorite river yet? Notice an area for improvement? Send us a request at [email protected] or submit an issue on our GitHub page. Collaborations, corrections, and helpful suggestions are welcome! Coming soon: incorporation of climate change scenarios in phenological and growth submodels. Stich, D. S., E. Gilligan, and J. M. Sperhac. 2018. shadia: American shad dam passage performance standard model for R. v 1.3.0. Available at: https://github.com/danStich/shadia. Posted 9-10-18: Presenters should take a look at this instructional video on preparing a presentation. It goes into suggestions on making legible graphs and even gets into the color theory and font choices. 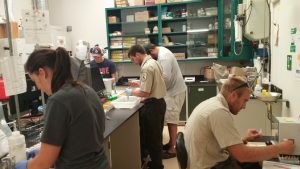 Posted 9-9-18: The New York State Department of Environmental Conservation (DEC) staff from Region 4 Fisheries and the Division of Water along with various volunteers teamed up for the annual riverwide Fish Count on Saturday August 11 at Peebles Island State Park and Corning Preserve this year. Public outreach events like this provide a great venue to generate interest in learning about and protecting the dynamic Hudson River watershed. Peebles Island is located at the confluence of the lower Mohawk and upper Hudson Rivers above the tidal estuary. The upper river also supports a high fish richness due to the many kinds of aquatic habitats available to both resident and migratory fishes despite being heavily polluted and designated as an ‘eat-no-fish’ section of the river (e.g., mostly PCB risks). For the fourth straight year, a pre-event fisheries survey (418027) was conducted by DEC to sample the local fish community and collected fishes for display. The upper river was boat electrofished above Waterford on the Rensselaer County side below Champlain Canal Locks C-1, C-2, and between the Schaghticoke and Lansingburg public boat ramps on Friday Aug 10 (see map attached, Tables 1-3 below). A total of 28 species were recorded for the event, including 25 species (165 fish) captured via boat electrofishing (2 more species observed), and one extra species collected by seine. Overall, we were two species short of our record of 30 fishes captured in 2017. Table 1. Results of 0.63 h of (day) boat electrofishing below Champlain Canal Lock C-1 Dam in the upper Hudson River in the town of Schaghticoke, Rensselaer Co., NY on August 10, 2018. Northern pike (1 large adult) was the only species observed but not scapped in the day effort below the Lock C-1 Dam (Table 1). This tailwater site is relatively shallow and rocky, with swift water along the right bank of the eastern side of the split channel, and a small but deep plunge pool to about 20 fow exists below the flood gates located to the east of the dam. This site could be seined along the far upper NE shore. Logperch and freshwater drum were the most common species found at site 1. Table 2. Results of 0.42 h of (night) boat electrofishing below Champlain Canal Lock C-2 Dam in the upper Hudson River in the town of Schaghticoke, Rensselaer Co., NY on August 10, 2018. Sea lamprey (1 subadult attached to what looked like an adult freshwater drum) was the only species observed but not scapped in the night effort below the Lock C-2 Dam (Table 2). This tailwater site is very shallow and rocky, with much bedrock that made navigation challenging. This is not a good site to seine due to numerous erratic boulders and rock piles all along the left bank below the dam. 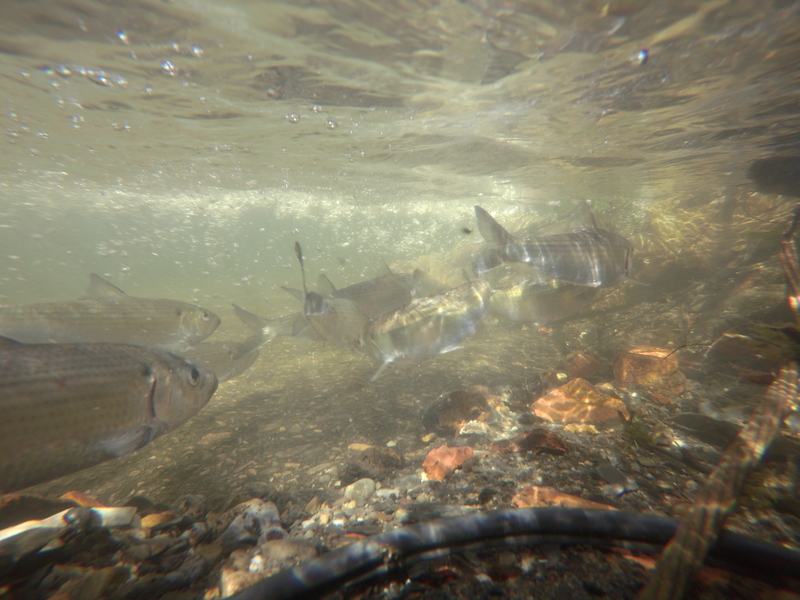 Many young of year (YY) blueback herring were observed upon arrival at the site, although very few were scapped. Smallmouth bass and channel catfish were the other most common species found at site 2. Table 3. Results of 0.57 h of (night) boat electrofishing between the Schaghticoke/Lansingburg public boat ramps in the upper Hudson River, Rensselaer Co., NY on August 10, 2018. Again, northern pike (1 large adult) was the only species observed but not scapped in the night effort between the boat ramps (Table 3). This flatwater site is relatively shallow and silty, with some random rocks, thick SAV, and a steep drop-off along the left bank. This site could be seined in several spots such as above the bedrock ledge just downriver of the Schaghticoke boat ramp, and father downriver where there are breaks in the shoreline boulders. Channel catfish, white perch, and smallmouth bass were the most common species found at site 3. Note, we scapped one of two bowfin not long after commencing the run confirming this new species is well established in the watershed now (found each year since 2015). Site 1 fishes were processed on site where all fish were measured, sportfish weighed, and various specimens saved for the fish count display. 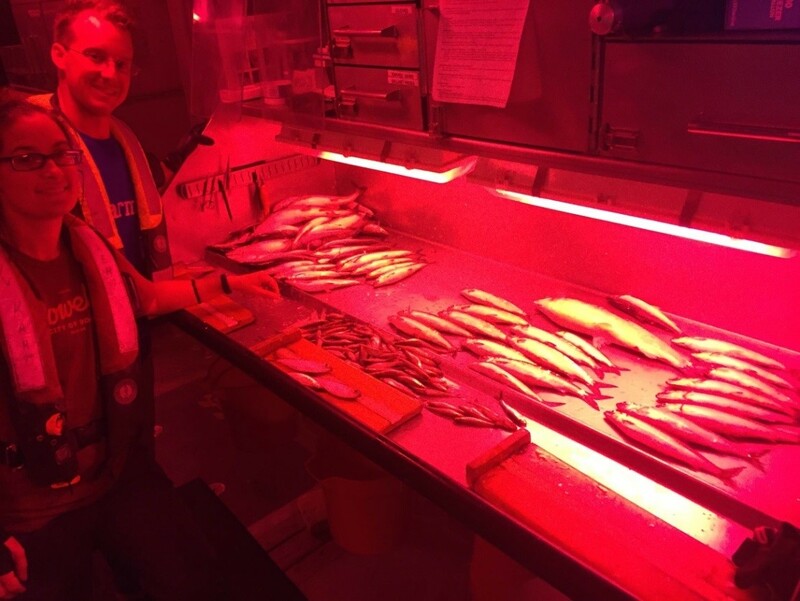 For sites 2-3, most fishes captured were transported back to Peebles Island for processing and a select group were held/stored overnight in a live fish cage. 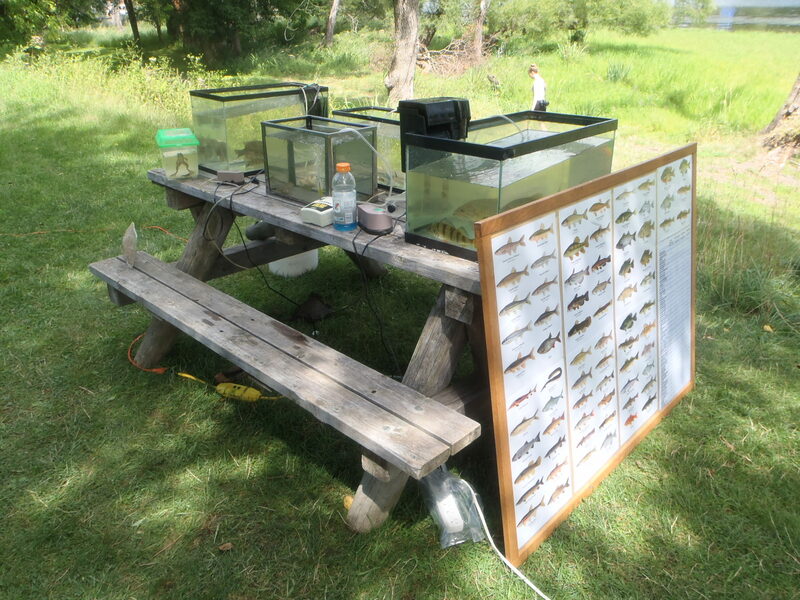 The next day we split up the species of various sizes for display at both river stations. Some tough seining also occurred amongst thick shoreline vegetation at the north end of Peebles Island on Saturday August 11. DEC and NYS Parks volunteers collected some 18 fishes, including one extra species – banded killifish, among a YY brown bullhead and bluegill, plus a few spottail and spotfin shiner. Unlike in 2017, a reporter from the Albany Times Union visited the Peebles Island station, posting four images with titles online (see press doc). At both stations, we set up our usual lineup of tables, aquaria, and many small/large plastic tubs displaying river fishes of various ages and sizes. A handful of enthusiastic youth observed and eventually warmed up to our specimens – often handling some over and over. Again, we had several attendees from local state offices along with some random park/bike path users that stopped and enjoyed looking at the fishes and discussing environmental topics with us. Fortunately, we got a break from the usual hot and humid weather on Saturday unlike previous years. Upriver we did not see any thunderstorms. However, once it began to rain about noon on Saturday it never stopped. We continue to learn much about the aquatic resources in the unique upper river and really enjoyed showcasing its rich fish fauna to the public and beyond (via google photos). 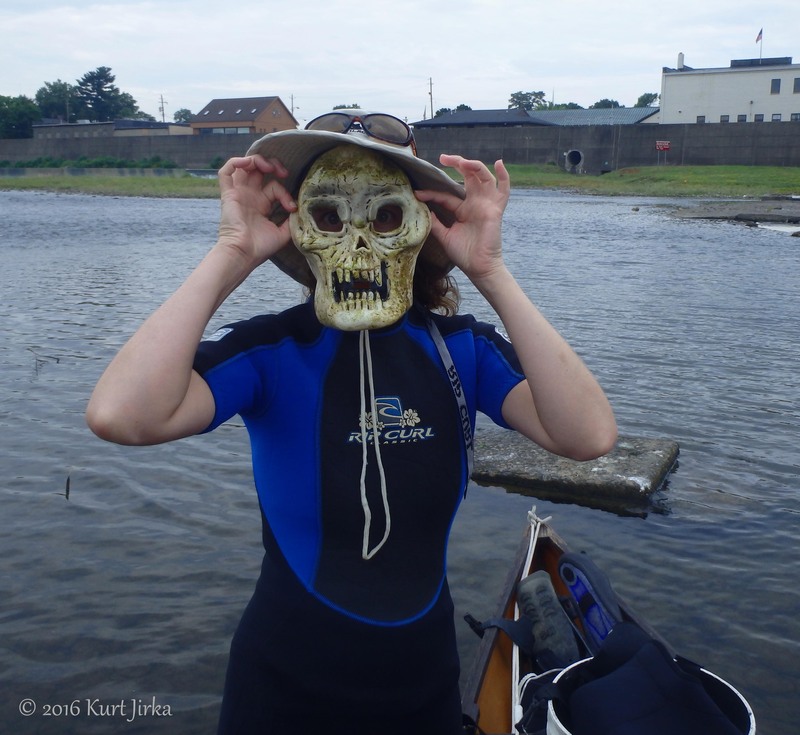 I consider these outreach events to be as sort of a public workshop for river ecology and fish identification. Too bad we often have so few local staff and volunteers to help work this important event that can make a difference in combatting the nature deficit in America. Better planning in 2018 did result in higher attendance (40+ at Peebles, 27 at Corning) compared to 2017 (20+ at Peebles) and a return to some press coverage was appreciated. 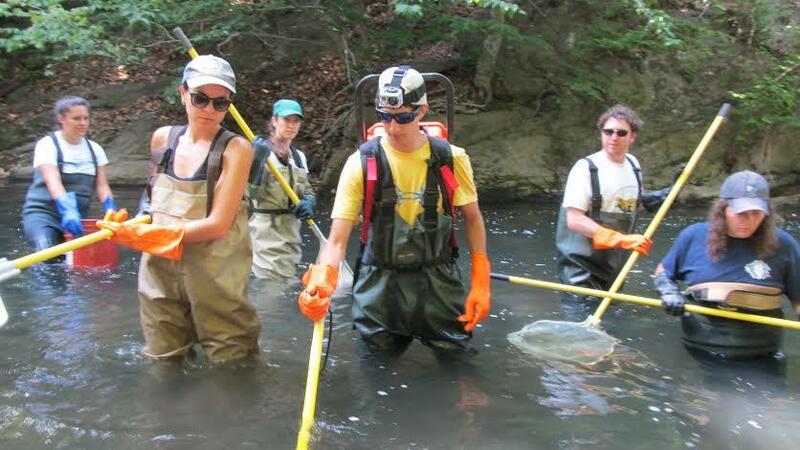 Kudos for all our hard work by our dedicated folks that assisted with yet another successful fish count. All images by S.Wells unless otherwise noted on individual slides. CREDITS: Friday eboat crew 1: Scott Wells (DEC), Bryan Weatherwax (NYS Museum), Vince Grilli (ret. DEC, vol); eboat crew 2: Scott Wells (DEC), Jared Parsons and Julian Canavan (SUNY Cobleskill, vol). Peebles crew: Kathy Czajkowski (DEC), Alexandra Yattaw (Parks vol), Kim Hill and Liam Covey-Shannon (SCA interns). No group photo was taken. 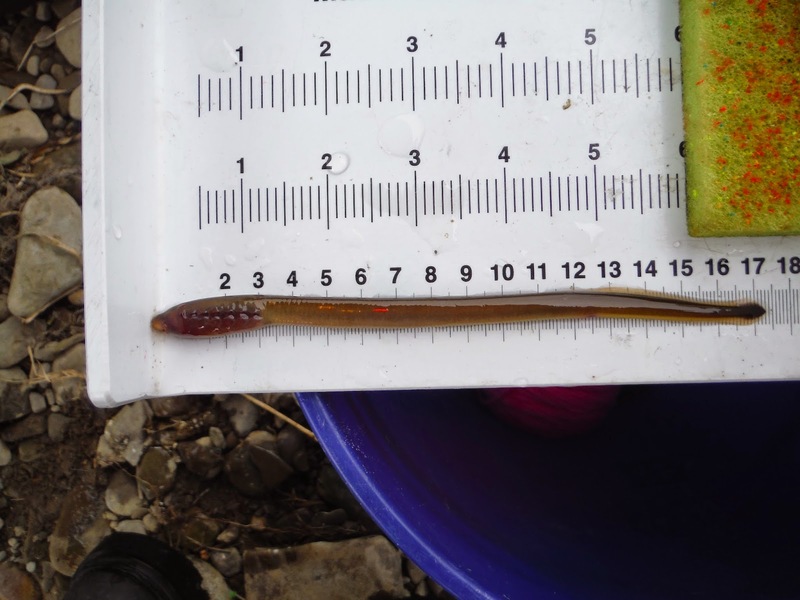 Posted 7-5-18: Summer interns at the SUNY Oneonta Biological Field Station stumbled on a surprise when they caught a 12” American eel on June 29th 2018 near the base of Cooperstown Dam at Otsego Lake, NY. The interns, Alexa Platt and Lauren Saggese, were electrofishing in the Susquehanna River to characterize fish assemblages (Platt) and invasive rusty crayfish densities (Saggesse) prior to the planned stocking of juvenile eels in the watershed. 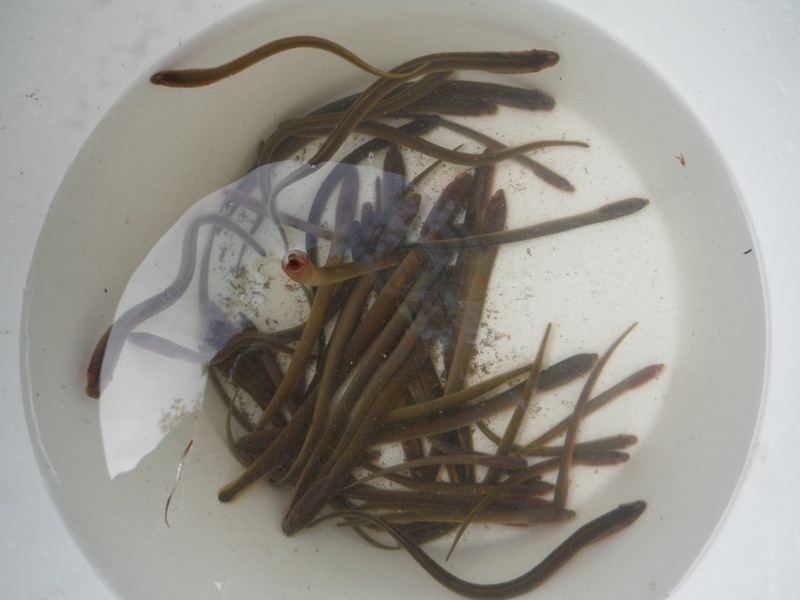 This work is part of larger eel restoration efforts in the Upper Susquehanna River involving New York State Department of Environmental Conservation, U.S. Fish and Wildlife Service, SUNY Cobleskill, SUNY Oneonta, and Hartwick College. The location represents the very upstream extent to the Susquehanna River, 444 miles from the Chesapeake Bay, and the terminal point to what historically was the longest fish migration on the east coast. American eels were reduced below detection during the late 20th century, the cause of which is largely attributed to construction of dams, and this find represents the most upstream record of the fish in the system in decades. 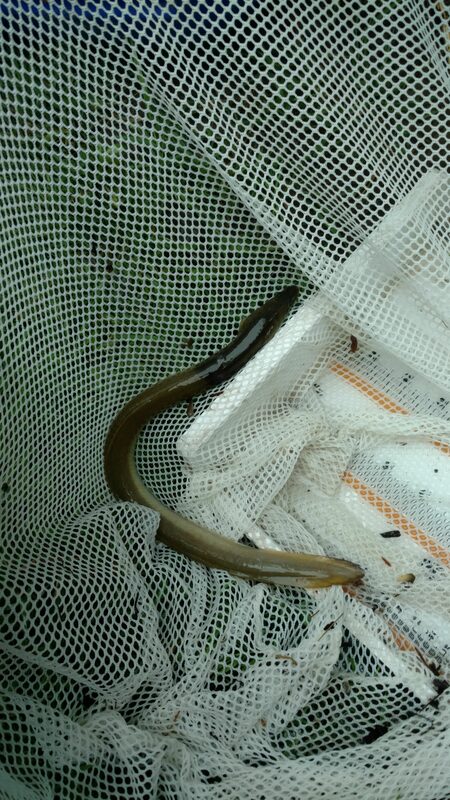 Needless to say, the find is generating much excitement among those enamored with the American eel. Posted 7-5-18: During May-June 2018, NY Chapter president Karin Limburg led a course of 8 students through a 9-day field course of watersheds in New York. See link below for the full writeup! Posted 5-15-18: See the great news in this recent Oswego County News Now Article suggesting that Lake Sturgeon populations in New York are increasing. NYCAFS chapter members Lisa Holst, Dimitry Gorsky, and Randy Jackson are quoted multiple times in the article. Posted 5-14-18: Take a look at this blog post entitled “How to overcome the challenges of communicating science“. http://www.brookes2cents.com/communicating-science/. 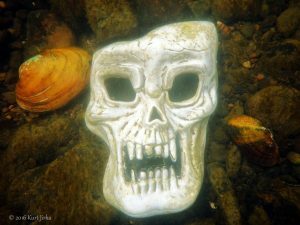 Posted 3-30-18: Quarry Dam’s days are numbered, as Lake Champlain Trout Unlimited now has completed the required funding and approval package to remove this obsolete barrier to fish and other aquatic life on the Ausable River. The Lake Champlain Basin Program recently announced a $3,950 grant to assist in funding the removal, and required permits from the US Army Corps of Engineers and New York State APA and DEC are now all in place. 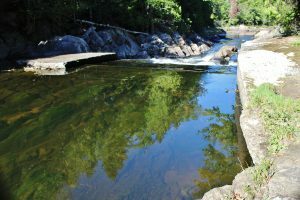 The dam, located about 4 miles East of Lake Placid, has served no useful purpose for years, but does block fish movement, warms water in its impoundment and inhibits genetic diversity in the area. Funding for the removal project involves multiple agencies, with grants and money forthcoming from Trout Unlimited Chapters in Queensbury, Plattsburgh and the Tri Lakes, with more funds coming from the Lake Champlain Basin Program, New York State Council of Trout Unlimited, Trout Unlimited’s National Embrace a Stream Program; Embrace a Stream Challenge Grant, and the US Fish and Wildlife Service. Total cost of the removal will be approximately $35,000, with the work to be accomplished during low water in the fall of 2018. Final project completion is expected by the close of 2018. Trout Unlimited is America’s oldest and largest cold-water fisheries conservation organization. Posted 2-16-18: The Recovering America’s Wildlife Act would redirect $1.3 billion of existing revenue annually to state-led fish and wildlife conservation efforts, effectively allowing the states to more fully implement their State Wildlife Action Plans. This legislation follows the recommendation of a diverse group of energy, business, and conservation leaders. This group, known as the Blue Ribbon Panel on Sustaining America’s Diverse Fish & Wildlife Resources, determined that an annual investment of $1.3 billion in revenues from energy and mineral development on federal lands and waters could address the needs of thousands of species, preventing them from needing to be added to the Endangered Species Act. New York would stand to receive $48.6 million annually to address the needs of fish and wildlife Species of Greatest Conservation Need and their habitats. This represents a $46.4 million increase over current State Wildlife Grant Funding to New York. The Chapter Executive Committee is considering a resolution to endorse the bill. Use the links below to learn more. Consider providing feedback to the Executive Committee by contacting Randy Vaas, Resolutions Chairman at [email protected] You can also contact your local member of Congress to let them know your view. 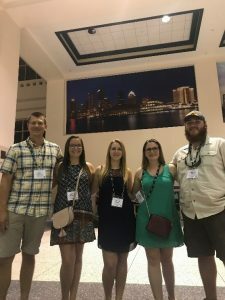 Posted 2-16-18: The American Fisheries Society’s Northeastern Division (NED) supports student travel to its annual meeting through the John Moring Student Travel Award. 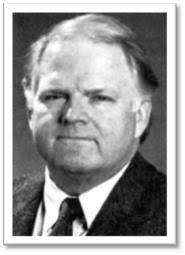 The award was established in 2003 to honor John’s legacy and promote student engagement in the NED. It is competitive and eligible to all students who will be presenting a poster or oral presentation at the division’s annual meeting and for students who will be attending the meeting to carry out NED business. This year’s meeting will be held in conjunction with the AFS annual meeting on August 19-23 in Atlantic City, NJ. All award recipients will receive $300 for travel expenses and a one-year AFS student membership. See full details and application instructions here. Posted 1-16-18: The Lake Champlain Chapter of Trout Unlimited will again provide scholarships for interested young men and women 11 to 17 years old to attend DEC’s popular summer camp program. 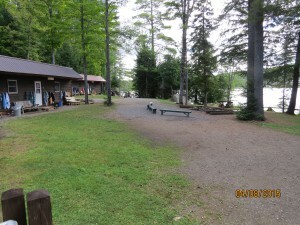 The camps, located at Camp Colby, Pack Forest, DeBruce and Rushford provide a great opportunity to learn more about the environment and have fun in the summer. Campers enjoy a week of summer fun and conservation education conducted by DEC’s well-qualified counselors. The scholarships pay all costs to attend. Parents provide transportation to and from the camps for the one-week sessions which are conducted in July and August. To apply, send a short, one-page letter telling why you want to go to camp to Susie Oliver, 2 Finlay Drive, Plattsburgh NY 12901 by 15 March 2018. The scholarships are limited to first-time attendees only and are “first come, first served.” Please include age, school, and phone number/email address. These scholarships are limited; so don’t wait to apply if you want a great summer adventure. For more information for campers and parents, click here or Google “DEC Summer Camps. Posted 12-6-17: Henry Hughes is a professor of English at Western Oregon University who grew up on Long Island and loves all things fish. He has written extensively on fishing and contributed this poem and illustration to our chapter newsletter. driving baitfish insane against musseled rocks. then you, Come on. A little closer. Another cast. Fish moving fast. Rocks under the hull. That’s enough, you hit reverse. Please, I say. Just a little closer. 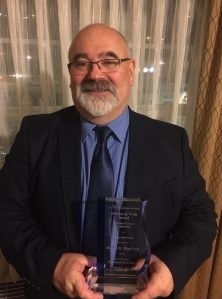 Posted 10-30-17: Dave MacNeill was awarded the 2017 William Q. Wick Visionary Career Leadership Award presented by the National Sea Grant Extension Assembly at its biennial meeting in Oregon earlier this month. 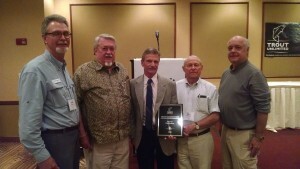 The Wick award is the highest honor given to Sea Grant Extension personnel by their peers. Click for full news article. Posted 10-20-17: For a third straight year, DEC’s Region 4 Fisheries organized a group effort in support of this popular riverwide public outreach event. 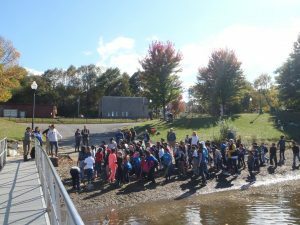 This event was tailored to combat the nature deficit among youth at the more urban grade schools along the Hudson River Estuary (Troy down to NYC), but has recently expanded into the Mohawk River drainage. In 2017, we gathered up a 16-person crew of inter-agency personnel from DEC including staff from R4 Fisheries and Habitat in Stamford, the Catskill fish hatchery, and DLE officers in Greene Co. Staff from the USGS in Troy, OPRHP in Albany, along with a DEC retiree and a SUNY Morrisville volunteer rounded out our team. 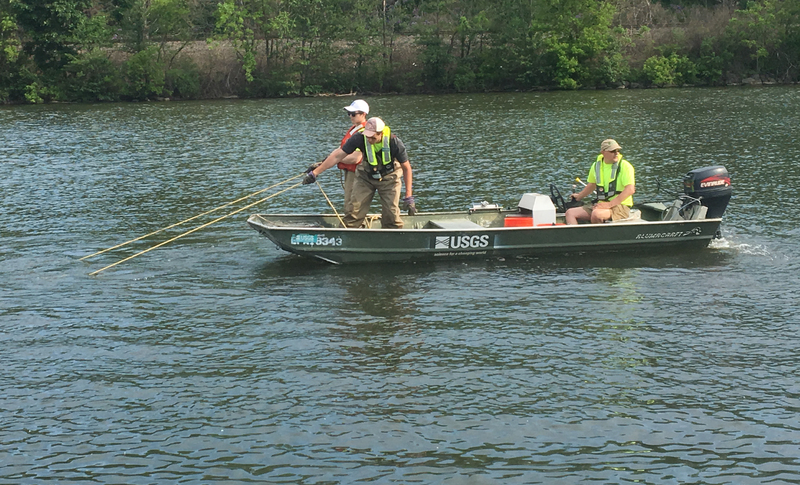 As usual, river sampling began the day before (Oct 11) with eight of the 16-person crew teaming up to electrofish three different sites in the lower Mohawk and upper Hudson River area from Niskayuna east to Waterford then south to Troy. Over 300 fish comprising 26 species were captured in 2.86 hours of boat shocking. Many of the larger and more hardy fishes were held in live cages for on-site retrieval and display the following day. Some of these fishes were also delivered to downriver river stations Thursday morning. New sites for schools in 2017 included lower Schoharie Creek in Middleburg, lower Mohawk River at Lock E7 in Niskayuna, and Jennings Landing on the Hudson River in Albany. Various other professionals from DEC, Natural Heritage, and Canal Corp; along with parents and event volunteers combined forces to mingle with teachers and educate numerous students in the greater capitol district on fish identification, anatomy, behavior, and habitat while answering a slew of other river-related questions. Everyone enjoyed a fun time with their respective school groups that ranged from grades 2-12. Team Stamford doubled their impact compared to last year, covering 12 schools at eight river stations impacting 648 students (avg. 54 youth/station) on a very nice and sunny/warm autumn day. This was by far our most widespread outreach. 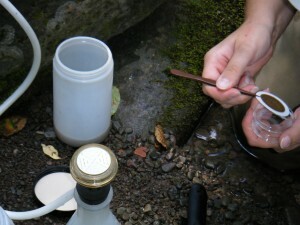 Water quality testing and beach seining were also common at many of the stations. It was another very successful outreach event that has grown to showcase the Hudson’s diverse resources to almost 5000 students each October for the last 15 years. 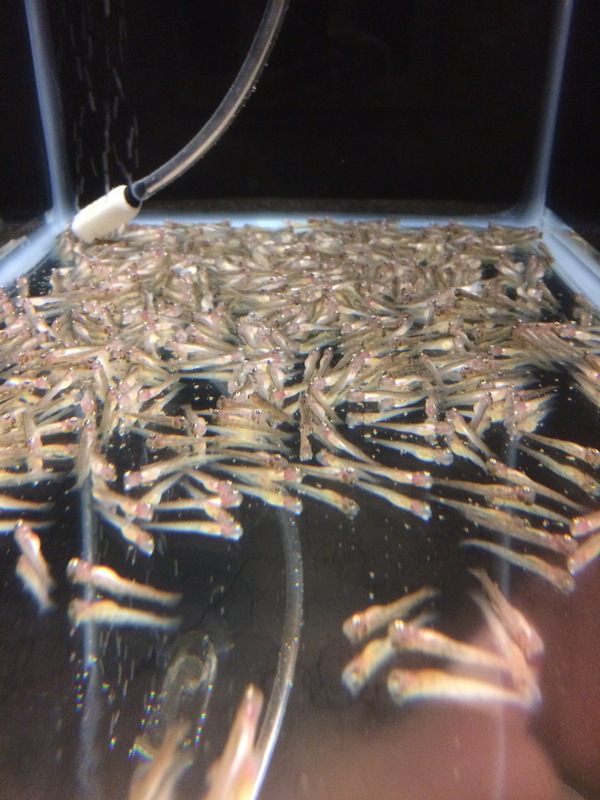 More science continues in the watershed as our small collection of juvenile river herring (mostly blueback young of year) will be examined by SUNY ESF researchers in an ongoing study to better understand the ecology of declining Alosines in this dynamic watershed. Posted 9-26-17: On Thursday, September 21, Cornell University hosted a workshop entitled “Environmental DNA Workshop: Research Frontiers & Management Perspectives in New York State”. 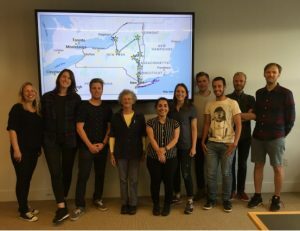 The workshop was put on by the New York Invasive Species Research Institute in partnership with the NYS Department of Environmental Conservation and the Atkinson Center for a Sustainable Future. The goals of the workshop were to explore the use of environmental DNA for detection of invasive and threatened species. 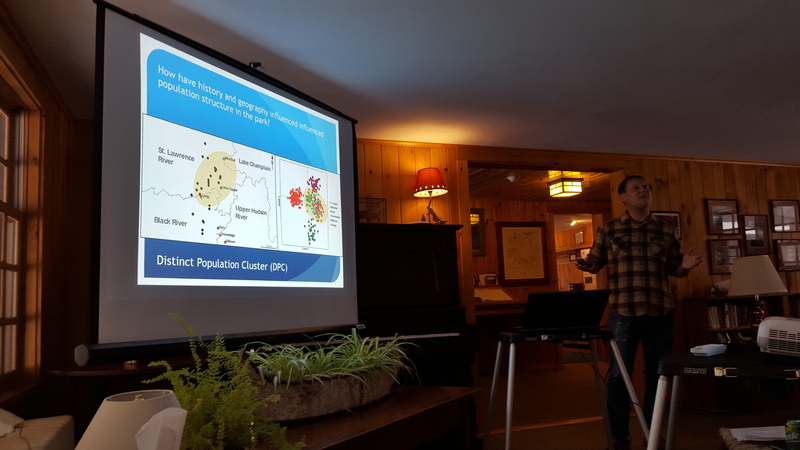 Presentations covered a range of topics, including the ‘state of the science’ and current limitations of eDNA, and examples of research projects using eDNA in New York, and examples of state and federal management agencies using eDNA to inform invasive species management decisions. A number of NYCAFS members, including fisheries managers and researchers, were in attendance as eDNA has great potential to change or supplemental how we currently monitor for aquatic species and entire communities. About 60 participants from the Cornell, NYSDEC, USGS, other NYS Colleges, Michigan DNR, NGOs, and private consultants attended. Posted 9-26-17: At the end of August, the SUNY Cobleskill Chapter of the American Fisheries Society sent four undergraduate students and our professor, Mark Cornwell, to the 147th Annual Meeting in Tampa, Florida. While there, we attended symposia and learned about new research and technologies upcoming in the fisheries profession. Our group met up with professionals from all over including businesses that attended the tradeshow, professors looking for new graduate students, and possible future employers. During the week, we met several SUNY Cobleskill alumni and other connections that they have made since graduation. The week was filled with fun socials and events that included trips to the Florida Aquarium and the Lowry Park Zoo, and ended with flight layovers and an unplanned overnight stay in Chicago. In all, it was a great week and an excellent experience for all of us! 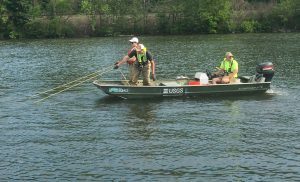 Posted 8-25-17: The U.S. Geological Survey has conducted 4 comprehensive Round Goby surveys at 12 sites on the Barge Canal/Mohawk River using environmental DNA (eDNA), trawling, seining, and trapping over the past two years. 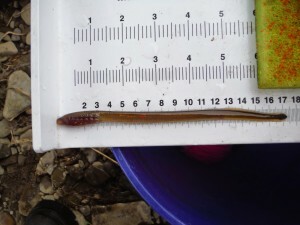 Since Round Goby colonized all of the Great Lakes in approximately 5 years and Oneida Lake in 2 years, when a specimen was caught by an angler on the Barge Canal in Utica in 2014, our expectation was that the species would quickly move through the Barge Canal/Mohawk River system towards the Hudson and Champlain drainages. Instead, our results suggest minimal expansion of Round Goby since 2014. 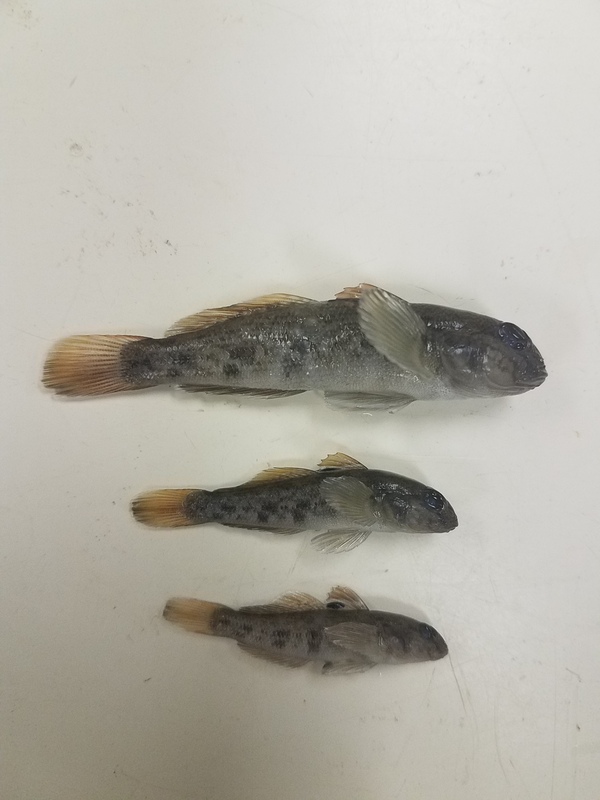 Trawling, seining, and trapping have only confirmed the presence of Round Goby at our western most site (Sylvan Beach near the east end of Oneida Lake) and eDNA has returned positive results only from Sylvan Beach and Utica (near where the 2014 specimen was captured). These results, while preliminary, suggest that eDNA may be a more sensitive technique for monitoring populations at low densities and also indicate that Round Goby populations are not rapidly expanding eastward as anticipated. It is probably naive to believe that the expansion will not continue but the reason for this apparent slowdown is unknown. Posted 8-25-17: The New York State Department of Environmental Conservation’s (DEC) staff from the Hudson River Estuary Program, Region 4 and 5 Fisheries, Division of Law Enforcement, plus various volunteers teamed up for the annual riverwide Fish Count on Saturday August 5th at Peebles Island State Park in Waterford, NY. 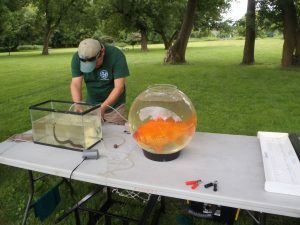 Public outreach events like this fish count provide a great venue to generate interest in learning about and protecting the dynamic Hudson-Mohawk River watershed. Peebles Island is located at the confluence of the lower Mohawk and upper Hudson Rivers above the estuary or tidal portion. This area also has high fish richness and habitat diversity despite being designated as an eat-no-fish section of the river. For the second time in three years, DEC Regions 4 and 5 Fisheries staff combined forces to sample the area’s fish community. 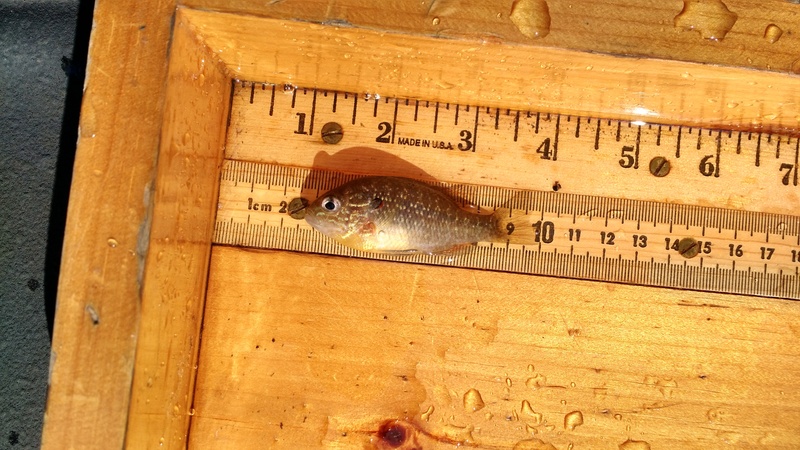 This year the upper Hudson River between Waterford upriver to the Champlain Canal Lock C-1 was sampled on August 4th producing 28 species of fish and a long hybrid Lepomis (sunfish). Two other species of fish were added while beach seining on August 5th during the event, totaling a record high fish count (30 species, see roster attached) for the Peebles station. Of the 30 fishes we recorded for the event, the most common species we displayed were spotfin and spottail shiner, banded killifish, yellow perch; followed by several smallmouth and largemouth bass, brown bullhead, channel catfish, bowfin, tessellated darter, and 4 species of sunfish (pumpkinseed, bluegill, green, redbreast). 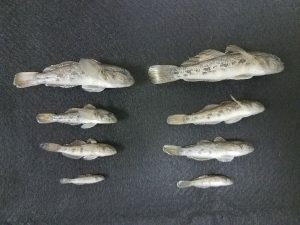 Most other species were represented by just a single specimen due to their size (northern pike, chain pickerel, freshwater drum), and most all of these fishes were returned alive to the river at the conclusion of the event. 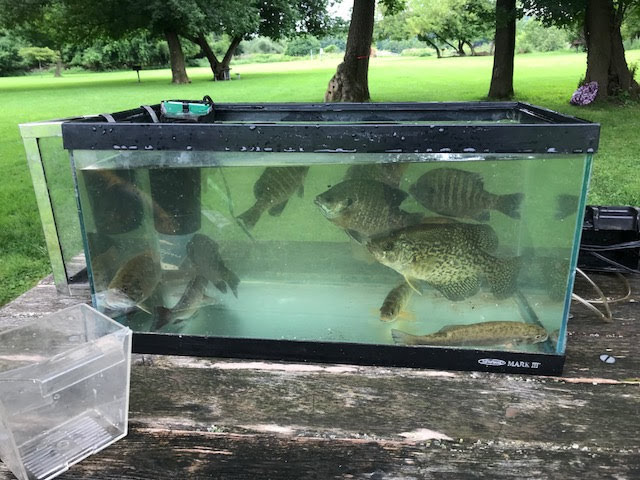 Interestingly, we have found than several river fishes like gizzard shad, white perch, and logperch do not fare well being held in live cages or handled much out of the water so they opted out of our display. 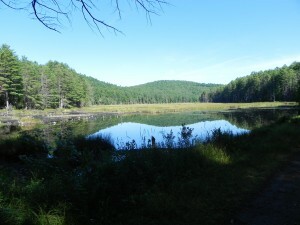 We continue to learn much about the aquatic resources in this unique area of the watershed. Posted 6-16-17: I (Lisa) am simply the messenger, but I’m so excited! 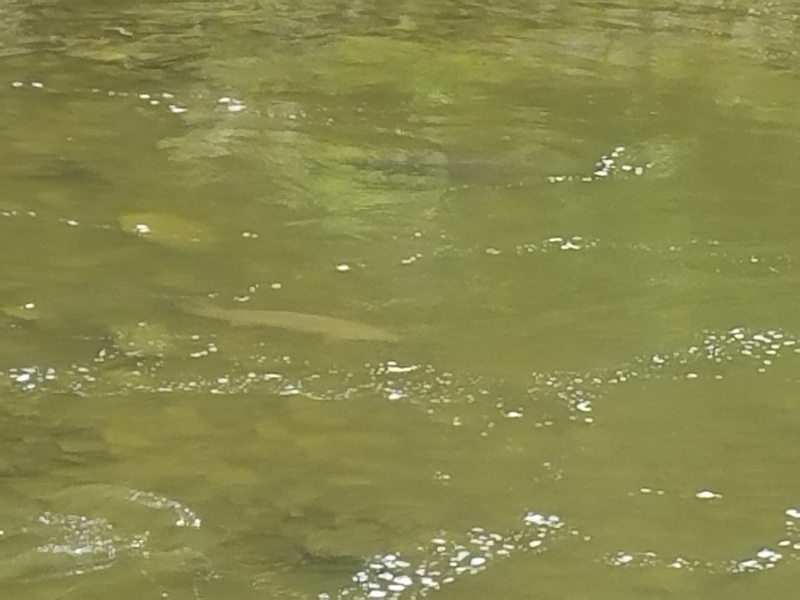 This morning I received an email from Dave Lemon relaying reports from anglers of sturgeon spawning in Fall Creek near the Lake Street Bridge in downtown Ithaca. Emily Zollweg-Horan was out in the creek this morning doing a lamprey assessment and was bumped by the sturgeon as they went by. Looks like the high water this year benefited someone! I’ve attached a picture that Emily took and she has video as well. Local TU members are apparently patrolling the area and keeping an eye out for shenanigans. So if you have a chance to stop down this weekend, you might see sturgeon in the creek still. Also see video footage taken by Jeremy Dietrich of Cornell University. 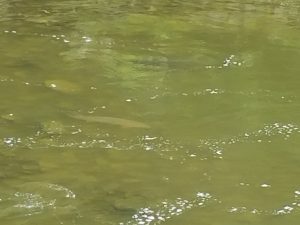 According to Jeremy, this is the first documentation of actively spawning lake sturgeon in Fall Creek (taken at Lake St. Bridge) since restoration efforts began in the early 1990s, and perhaps the last spawning since the species was effectively extirpated from Cayuga around 1900. 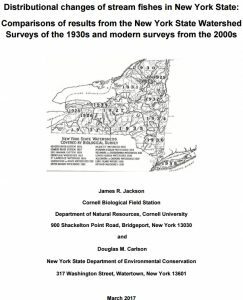 Posted 5-22-17: The report, “Distributional changes of stream fishes in New York State: Comparisons of results from the New York State Watershed Surveys of the 1930s and modern surveys from the 2000s” is a valuable companion report to the Atlas of Inland Fishes of New York. 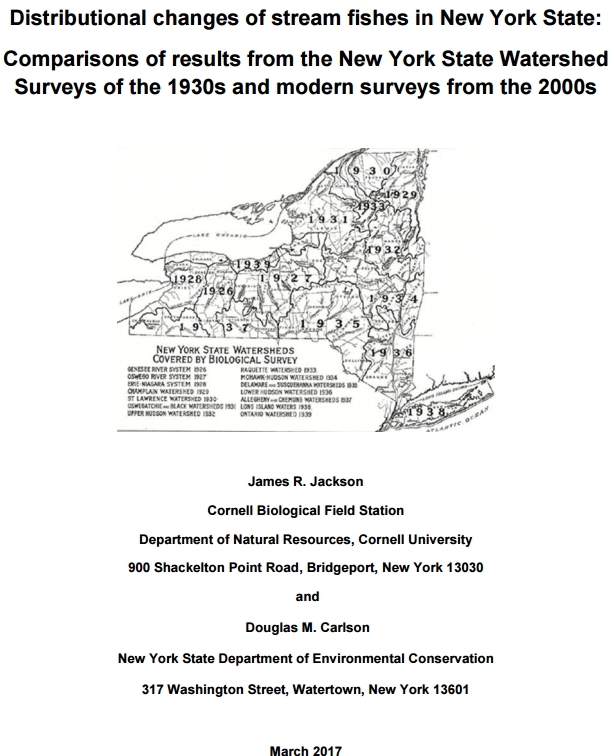 Dr. Jackson and Doug Carlson analyze the broad changes in distribution of fish over time between the watershed surveys conducted from 1926-1939 and Doug’s more recent sampling from 1996-2010. The report is available at Report PDF and the fish atlas can be downloaded from http://www.nysm.nysed.gov/publications/record or purchased from http://newyork.fisheries.org/atlas-of-inland-fishes-of-new-york/. Posted 3-20-17: This spring, a project that we recently completed at The College at Brockport titled “Thiamine deficiency and the effectiveness of thiamine treatments through broodstock injections and egg immersion on Lake Ontario steelhead trout” was just published in The Journal of Great Lakes Research. This experiment determined the extent of thiamine deficiency in steelhead trout from Lake Ontario by determining thiamine concentrations in various tissue from adult fish and also offspring mortality rates caused by the deficiency. In addition, the project compared the effectiveness of different thiamine treatments to evaluate their effectiveness in limiting offspring mortality. We found that injecting adult fish with thiamine prior to spawning, immersing eggs in thiamine rich water, and giving both treatments all lowered offspring mortality to similar levels. The article is in the second issue of The Journal of Great Lakes Research for this year. Futia et al. 2017. 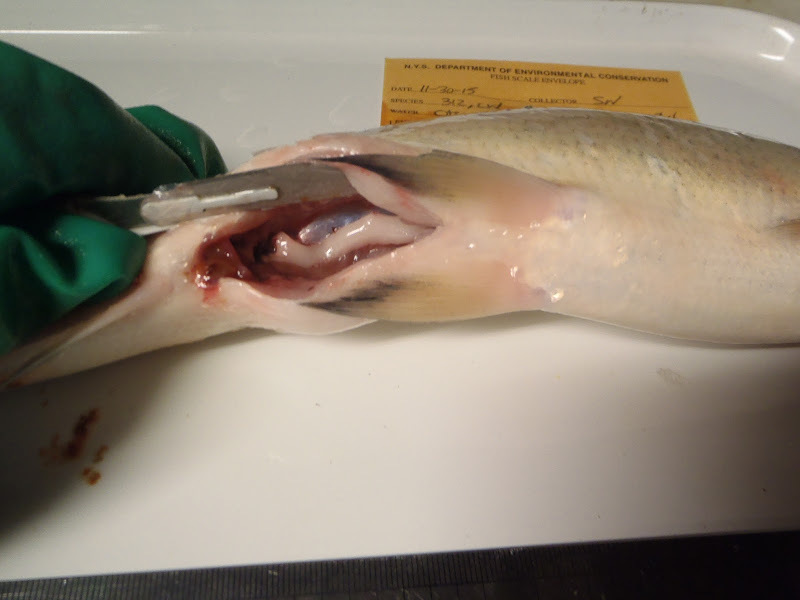 Thiamine deficiency and the effectiveness of thiamine treatments through broodstock injections and egg immersion on Lake Ontario steelhead trout. Journal of Great Lakes Research 43:352-358. 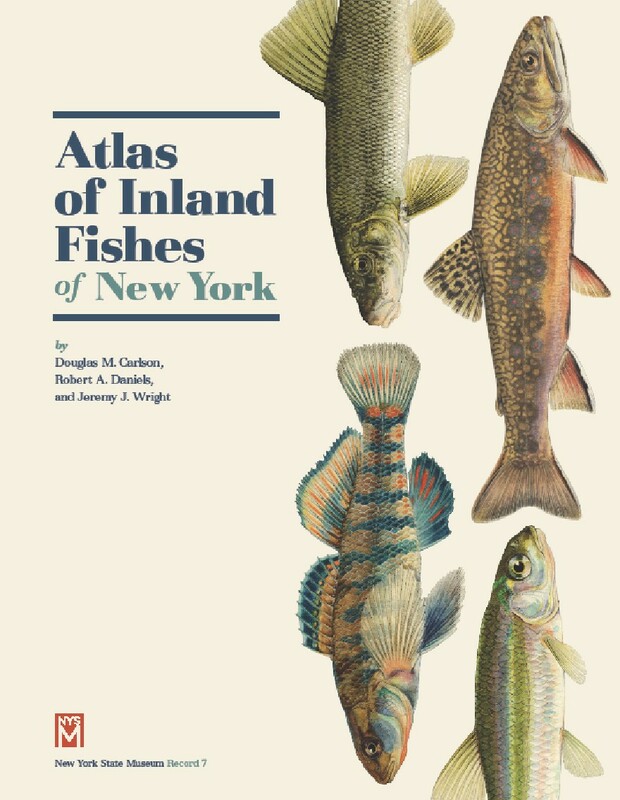 Posted 3-20-17: The recently completed Atlas of Inland Fishes of New York is available from the online journal NYS Museum Record at no cost. The atlas has accounts for 179 fish species with detailed maps, fish pictures and annotations, in the 370 pages. The 460,000 fish records are available through a link to the entire data set. 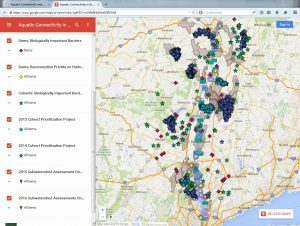 The full length atlas can be downloaded at: http://www.nysm.nysed.gov/publications/record. Posted 3-15-17: At this year’s Adirondack Research Forum, Benjamin Marcy-Quay (Cornell University Adirondack Fishery Research Program) presented data indicating that white suckers (Catostomus commersonii) undertake diel movement between lakes. 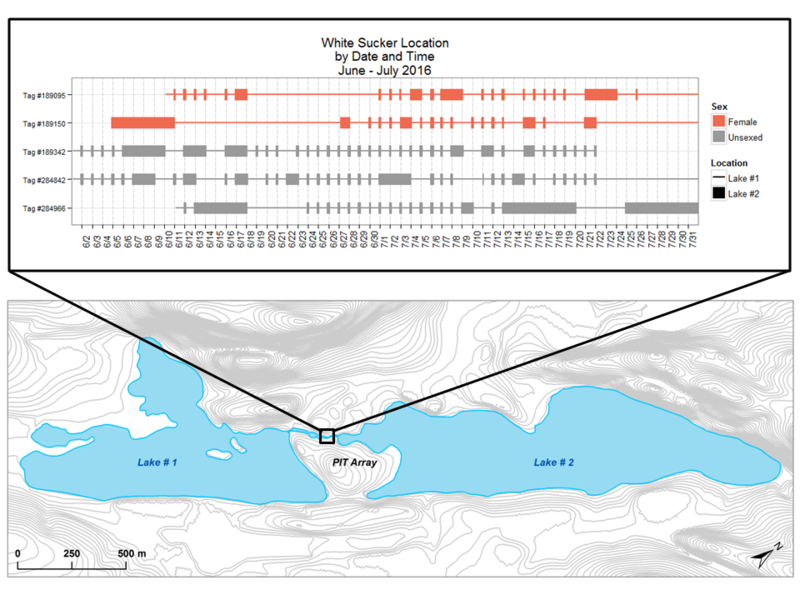 PIT-tagged suckers were detected moving across an antenna array located in a narrow channel between two Adirondack lakes on a nightly basis during June and July, leaving one lake at sunset and returning shortly before dawn the next morning. 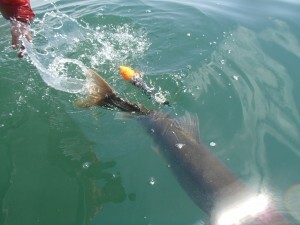 Fish repeated this pattern day after day, with one individual making 29 similar trips in a 60-day period. While not a game species, white suckers are widespread in New York and can comprise a significant portion of the fish biomass in many waters. The potential for inter-lake movement therefore might have a substantial influence on food web linkages in networks of connected lakes and streams. Future plans include the use of VHF-tracking and diet analysis to better understand the extent and drivers of sucker movement in Adirondack ecosystems. 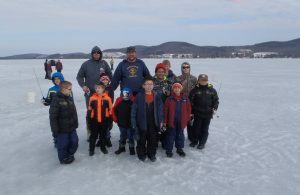 Posted 3-8-17: On a very mild winter day at Canadarago Lake, the NYSDEC and OPRHP teamed up for an 8th straight year to ice fish with the public on Wednesday, February 22nd. With no safe ice again this winter on Otsego Lake off Glimmerglass SP, the event was held for the 3rd time on the mid-west shore of Canadarago Lake. Staff from the local park provided some snacks and warm drinks on site at the boat ramp, while DEC/OPRHP fisheries staff and volunteers educated and guided some 60 attendees at this free event. Despite a warming spell over the prior weekend, the slushy lake surface refroze by Tuesday and a solid 10-11 inches of ice remained. Air temperatures rose quickly on Wednesday and were in the 50s for most of the day and likely reached around 60°F+ under the mid-day rays when most attendees were forced to shed their jackets. We saw many new faces this year and a few local anglers came out with their own gear to fish with us. After the brief introduction for newcomers, the on-ice crew took over to guide anglers on bottom fishing with light tackle, manage tangles, rebait hooks, and demonstrate how to drill holes and deploy tip-ups. Many youth were quite serious about their fishing. 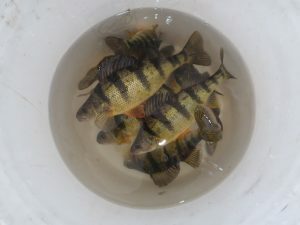 Some 60 yellow perch were caught during the event mostly on small colored jigs with live spikes (fly grubs). The majority of the yellow perch appeared to be young 2-4 year old fish measuring about 4-7” but we did capture several dozen fish over 8” and a few nice jack perch (≥ 12”). Posted 3-2-17: Approximately 55 professionals and students attended the Adirondack Research Forum in Old Forge this week. The meeting brings together scientists working in the Adirondacks to present ongoing research and discuss future collaborations. Many AFS members were in attendance representing the NYSDEC, USGS, Cornell, SUNY ESF, and many other institutions. Presentations ranged from chemistry of surface waters to changing zooplankton communities to mercury concentrations in fish tissue. Posted 1-17-17: The U.S. Geological Survey and Paul Smith’s College recently collaborated on a study which found environmental DNA (eDNA) could be used to successfully determine the presence/absence and abundance of Brook Trout. Environmental DNA analysis is rapidly evolving as a tool for monitoring the distributions of fish and wildlife populations. 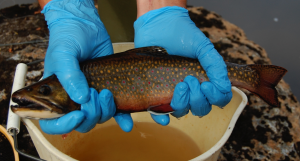 During 2015, the DNA of Brook Trout Salvelinus fontinalis was analyzed from water samples collected at 40 streams across the Adirondacks where quantitative electrofishing surveys of Brook Trout populations were recently conducted. The eDNA results correctly predicted the presence/absence of Brook Trout at approximately 90% of the study sites and also explained 44% of the variability in Brook Trout population density and 24% of the variability in biomass. These findings are exciting because they suggest that eDNA samples can be used for more than just presence/absence and may be able to say something about the abundance of a population. 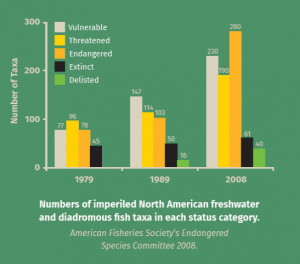 This study was published in Transactions of the American Fisheries Society and can be accessed HERE. Posted: 11-10-16: A basic understanding of the taxonomic classification and evolutionary history of any species is a critical component to broader biological and conservation-based studies. Join Curator of Fishes Dr. Jeremy Wright as he discusses his current research to unravel the complex taxonomic and systematic history of the Bowfin, a primitive fish found throughout New York and the Eastern United States. 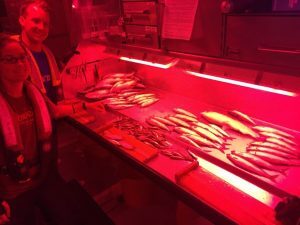 Posted: 10-28-16: For a second straight year, DEC’s Region 4 Fisheries collected fishes at night on October 19th and held them in live cages for a next-day delivery to various stations along the Hudson River for youth education. 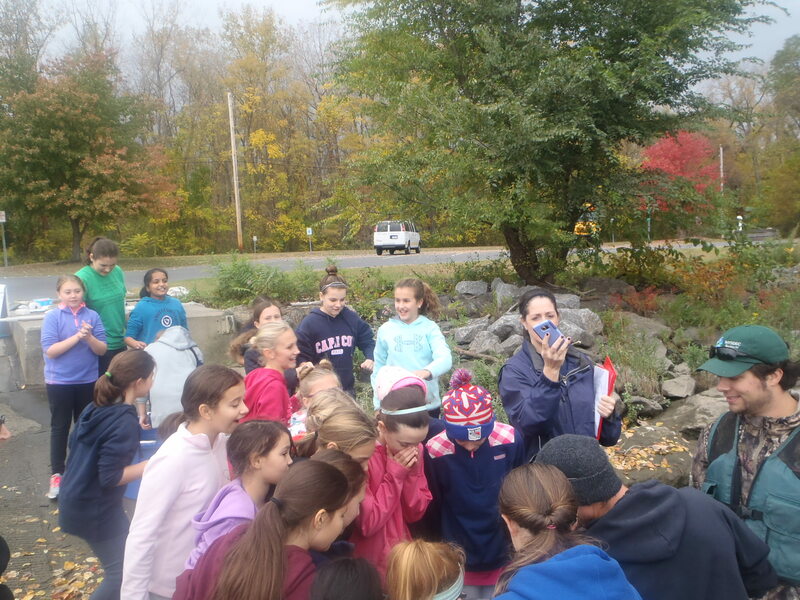 A total of 12 staff from our Stamford, Schenectady, Albany offices; Division of Water and Law Enforcement, the USGS in Troy, and one retiree combined forces to assist nine different schools at six river stations totaling 367 students or about 46 students per station on a cool but calm and dry autumn morning. 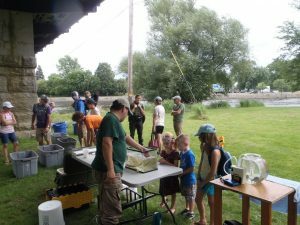 This year we were able to deliver about 300 (mostly) adult river fishes comprising 29 species to six of the 14 total river stations in Region 4 that expanded 16 river miles (RM) from Peebles Island in northern Albany Co. down to the Papscanee Preserve in southern Rensselaer Co. Other river stations like Cohotate and Coxsackie to the south were visited by local ECOs where they helped beach seine river fishes, a common practice for this event. All workers helped put a dent in the youth-wide nature deficit that day, mingling with and educating numerous students, teachers, even some parents on fish identification, anatomy, behavior, habitat, and answering other river-related questions. It was another very successful public outreach event that has grown to showcase the Hudson’s diverse resources to an amazing 4700 students each fall on October 20th, which now extends above the estuary and into the Mohawk River. Our collections of juvenile blueback herring near the Mohawk River were delivered to SUNY ESF for continued research on this declining anadromous species. Posted 10-28-16: As aquatic biologists, it is not often that we work in urban environments, but on those occasions when we do, we may find that there can be as much “wildlife” there as in more rural areas. A case in point was a recent experience we had conducting a survey for rare freshwater mussels on the Chemung River in downtown Elmira, NY. The river in the 1,000-m survey area was flanked by levees and concrete walls on both sides and crossed by five bridges and a low-head dam. Trash, old demolition debris, abandoned bicycles, shopping carts, and even a skeleton mask were among the many unnatural features encountered during the survey. 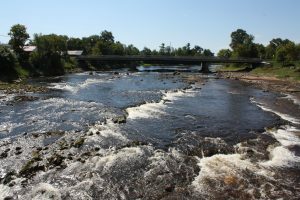 However, the river was also filled with aquatic life, including large walleye, smallmouth bass, common carp, various suckers, and myriad minnows and darters. And yes, rare mussels as well. 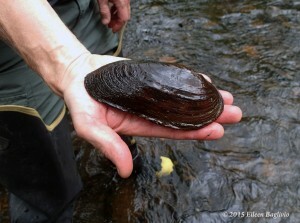 We found dozens of green floaters, listed as threatened in NY, over 400 yellow lampmussels, a Species of Greatest Conservation Need, and nearly 600 other mussels representing three additional species, as well as the invasive zebra mussel and Asian clam. Despite the highly altered condition of this section of river, it still supported valuable and unique aquatic resources and reflected the resiliency of our natural world in the face of human-generated perturbations. However, the mussels, fish, bald eagles, and ospreys we observed were not the only “wildlife” encountered. Our six days on the river included: finding a box of 22-caliber shells (with one missing), the remains of a 22-caliber handgun (later determined to be a starter’s pistol), and a large kitchen knife; a friendly encounter with a wearer of a tracking device on his ankle; witnessing what appeared to be a parking lot drug deal; and watching a police foot-chase of a suspect across the railroad bridge over the river just upstream of us. We also heard tales, unfortunately sad but likely true, of homeless people sleeping under the bridges and eating the freshwater mussels we sought. Our survey was an educational experience, from the surprisingly productive and impressive aquatic resources to the potential hazards of conducting a biological survey in an urban river environment. So, if you get the chance to work in an urban setting, don’t be surprised if you unmask the unexpected. Posted 10-25-16: In 2014, the U.S. Geological Survey and the New York State Department of Environmental Conservation initiated a study to assess the status of fish communities in the Mohawk River-Barge Canal system. The effects of water-level drawdowns in the winter were of particular interest. This study found significant differences in both the abundance of fish and the composition of fish communities in river sections which were drawn down versus those in which water levels remained largely unchanged. The results of this study were recently published in a journal article by Scott George, Barry Baldigo, and Scott Wells in Transactions of the American Fisheries Society. The online version is available now HERE and the article should appear in print shortly. Posted 9-12-16: The Saint Regis Mohawk Tribe (Tribe) is making substantial progress toward the decommissioning and removal of the Hogansburg Hydroelectric Project. 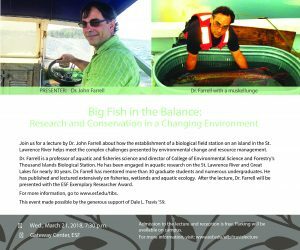 The Project is the first impassible barrier to migratory fish on the St. Regis River, a tributary to the St. Lawrence River. Approximately 220’ of the concrete spillway is completely removed. The remaining 30’ of spillway and the stoplog gate section will be removed thru the end of September. The project is expected to wrap up by November 1. In 2015, the Tribe became co-licensee of the federally licensed hydro dam to restore river ecology and repatriate lands under the Tribe’s boundary claim. 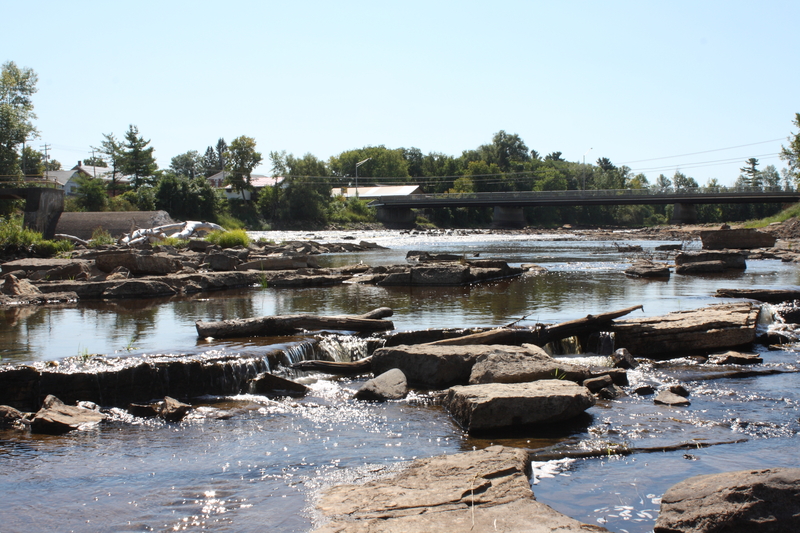 The Tribe has future plans to redevelop the site for public river access and create an art park to showcase Mohawk artists. Posted 9-2-16: For the first time, the USGS Lake Ontario Biological Station (LOBS) RV Kaho joined the Lake Ontario Acoustic Survey conducted annually by the Ontario Ministry of Natural Resources and Forestry and the NY Department of Environmental Conservation. USGS focused on midwater trawling and captured over 360 Cisco, a species that historically dominated the native Lake Ontario fish community. Interestingly, this year’s traditional survey methods (bottom trawling) failed to collect any Cisco in these same lake areas. Identifying efficient methods to collect Cisco will be critical to the growing bi-national effort to restore this native species. 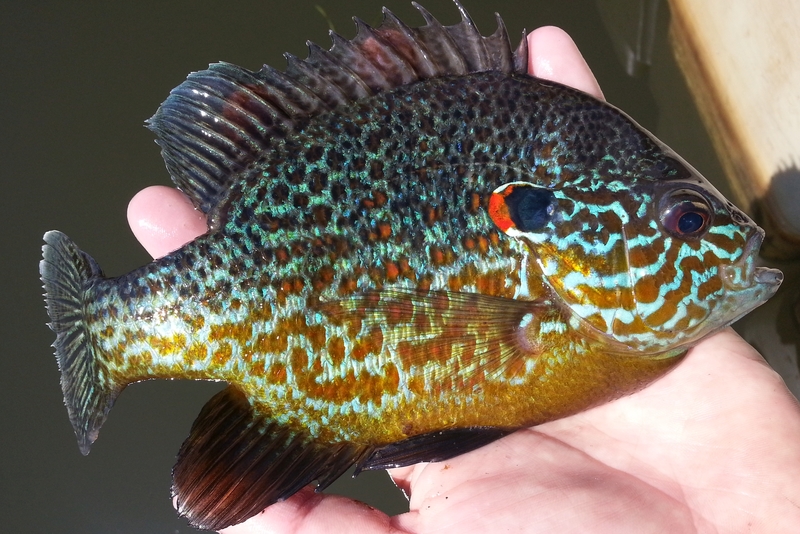 To gain as much information from this unique catch, partners including the US Fish and Wildlife Service, Cornell University, and the USGS Tunison Laboratory sent researchers to Oswego NY, August 8-11, 2016. A nine-person team collected data and samples on morphometry, genetics, biochemistry, hatchery marked structures, maturity, diet, growth, and age. This collaborative field and lab effort will provide resource management an unparalleled amount of information on the current status and behavior of this native species in Lake Ontario. Posted 8-22-16: Again this year, staff from the NYS: OPRHP, DEC, Fish Museum, plus a few volunteers conducted another successful public outreach event in Waterford. The Great Hudson River Fish Count in particular is geared towards showcasing the rich fish fauna of the Hudson River from Waterford to NYC and acts as sort of a public workshop for fish identification. Peebles Island State Park at the confluence of the lower Mohawk and upper Hudson Rivers offers a great venue for this type of public event; open for day use to enjoy both riverscapes year-round and free of charge. About 40 attendees came out to endure the hot weather on the river and many eager youth really enjoyed getting wet with the fishes. Region 4 Fisheries combined a fish survey with this event to provide live adult river fishes for display, which were very popular with the onlookers. We captured and identified an impressive 27 fish species in the 2016 event. The most common fishes displayed were: Spotfin and Spottail Shiner, Banded Killifish, Channel Catfish, Tessellated Darter, Smallmouth and Largemouth Bass. Most other species were represented by just a few specimens. A replicate catch of Bowfin confirmed that this relatively new species to this confluence area is likely established via a southern range expansion down the Champlain Canal from the north. We learn much about our natural resources just be getting out on/in the water ourselves. Posted 8-16-16: In July 2016, Scott George, Barry Baldigo, and others at the USGS conducted a fish community survey on Buck Creek. Buck Creek is a tributary to Seventh Lake in the Fulton Chain of Lakes in the western Adirondacks. Buck Creek and the surrounding landscape were subjected to severe acidification over the past 4-5 decades and at one point the stream was so toxic it could not support fish. Recently, USGS fish community surveys have confirmed populations of a few fish species such as brook trout, central mudminnow, and tessellated darter, likely as a result of improvements in water chemistry following the implementation of the Clean Air Act and amendments. During the 2016 survey, young-of-the-year landlocked salmon were captured in the study reach for the first time. The Ichthyology Lab of the NYS museum confirmed the identity of these individuals and a few specimens have been archived in the museum’s collection. 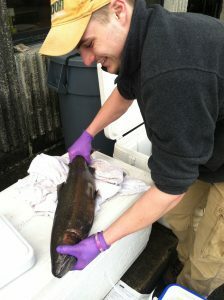 This is a significant finding because it indicates that salmon (currently stocked in Seventh Lake by the New York State Department of Environmental Conservation) reproduced successfully in or near Buck Creek. Furthermore, salmon are generally considered to be more sensitive to low pH and elevated inorganic monomeric aluminum than brook trout – so the presence of this species in a stream that was once too toxic to even support brook trout suggests further improvements in water chemistry have occurred. The mild winter and the absence of an acidic snowmelt-pulse this spring may be partly responsible for the successful reproduction of this species. It is possible that other formerly acidified streams in the region may be seeing similar increases in acid-intolerant species. Analysis of fisheries and water chemistry data from approximately 40 streams in the Adirondacks sampled during 2014 and 2015 should help further assess the regional status of fish communities. Posted 6-20-16: The City of Troy in partnership with the Department of Environmental Conservation and Riverkeeper recently removed a dam on the Wynants Kill in south Troy that restored more than a quarter-mile of spawning habitat for river herring, reviving a spawning run for the first time in 85 years. The dam removal also is allowing upstream passage for other fish species such as American eel, white sucker, and yellow perch. The Wynants Kill is a tributary of the Hudson River estuary; this is the first barrier mitigation project that improves connectivity for migratory fish in the estuary. The restoration of historic spawning habitat is an important component of DEC’s river herring fisheries management plan. 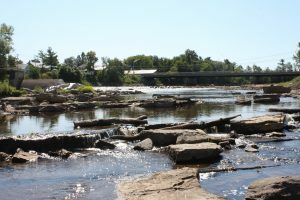 The removal of the dam was funded by the Environmental Protection Fund (EPF) through a Hudson River Estuary Program Grant for “Tributary Restoration and Resiliency”, awarded to the City of Troy in January of this year. The grant amount was $12,500. Read more about the dam removal at the Albany Times Union, Associated Press or the Smithsonian Magazine. 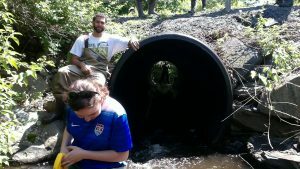 Posted 6-20-16: The NYSDEC and the Water Resources Institute (WRI) at Cornell University, as well as more than 15 other partner organizations, are assessing culverts and bridges to identify the most problematic barriers to fish and other organisms that use streams and riparian habitats. Using the North Atlantic Aquatic Connectivity Collaborative’s passability protocols and WRI’s coarse-scale modeling for culvert capacity, towns and counties are getting an idea of which culverts are ecological and economic hazards. Dr. Bob Schmidt and Ricky Brase from Marist College have started a research project to look at the impacts of problem culverts on American eel populations, electroshock sampling up and downstream from assessed culverts and looking at the relationship between problem culverts and eel numbers. WRI’s webpage has more information on the eel research project’s first year results and which culverts have been assessed and prioritized. 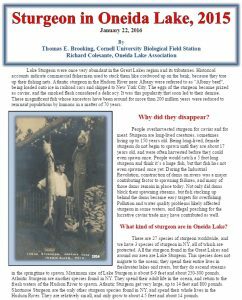 Posted 6-4-16: The Cornell University Biological Field Station recently completed an interesting summary article on the history and recent status of Lake Sturgeon restoration efforts in Oneida Lake. This semi-scientific article, written in conjunction with the Oneida Lake Association, was intended for a cross-dimensional mix of the general public as well as more scientific oriented folks. Historical accounts of Lake Sturgeon in Oneida Lake from as far back as 1856 are noted, and sturgeon biology specific to Oneida Lake is summarized using data collected from ongoing Cornell University sturgeon netting surveys. The up to date status of restoration efforts is presented, along with some interesting results on long distance sturgeon movements from tagging studies. We encourage anyone to use this article to for any educational groups or handouts, or pass it along to others. To learn more about Lake Sturgeon in Oneida Lake, you can find the full article available at: https://cornell.box.com/s/y8s0m03yyti496brf0zj79bd4wyjgtc. 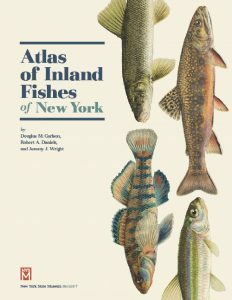 Posted 5-10-16: The recently completed Atlas of Inland Fishes of New York is available from the online journal NYS Museum Record at no cost. The atlas has accounts for 179 fish species with detailed maps, fish pictures and annotations, in the 370 pages. The 460,000 fish records are available through a link to the entire data set. The full length atlas can be downloaded at: http://www.nysm.nysed.gov/publications/record. Posted 5-5-16: A pilot project led by Drs. Donna Cassidy, Rod Getchell, Dave MacNeill and Jim Casey addresses the significant threat posed by the rapid increase of invasive aquatic species in New York waterways from both a research and an educational perspective. Emerging technologies monitoring environmental DNA (eDNA) assessed with quantitative qPCR technology show great promise for detecting the presence of a wide range of species. The project develops a joint school/research eDNA approach for assessing the presence of invasive species, providing an in-depth pilot study of the use of a collaborative research model in middle and high schools to determine invasive species levels in New York and beyond, while also providing significant data regarding levels of invasive species in selected New York waterways. 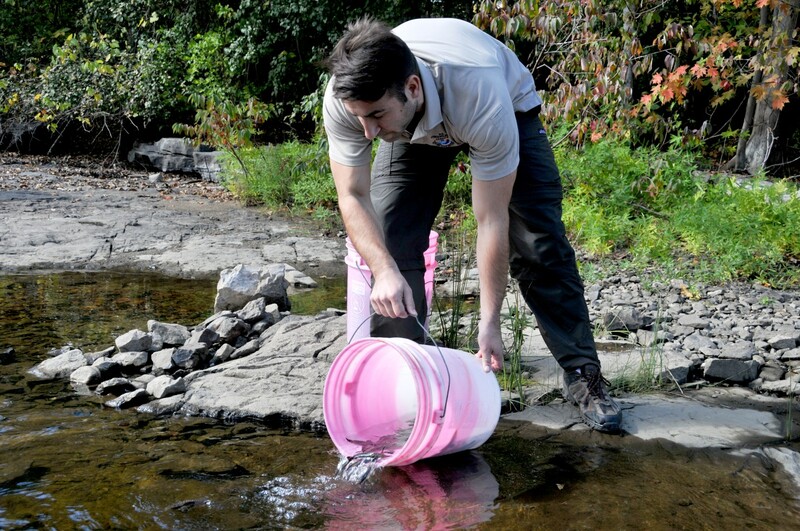 In the first year we have engaged over thirty-two of sixty-six schools throughout New York State and have collected and filtered water samples from 84 sites (https://tetrahymenaasset.vet.cornell.edu/invasive-fish-program/edna-testing-results/). We have found invasive round goby at sites not previously reported by USGS. The presence of all four species of Asian carp as well as sea lamprey and snakehead are also monitored. Students access their results through the web page that also provides an avenue to further explore the ecological consequences of invasive species and well as DNA biochemistry. The program encompasses a broad spectrum of society ranging rural and Native American students to under represented inner city minorities. This project has the potential to be expanded to reach 13,000 students in 26 states that already participate in the Tetrahymena ASSET program (https://tetrahymenaasset.vet.cornell.edu/) at Cornell. Posted 3-23-16: In July of 2014, the New York State Museum, in cooperation with colleagues at Stony Brook University’s Southampton Marine Sciences Center, took possession of Dr. Howard Reisman’s (Emeritus Professor, Long Island University) personal collection of fish specimens. This material included over 2,500 individual specimens, which were collected throughout the world over the course of Dr. Reisman’s 35 year career, including a substantial number of samples from the marine waters surrounding Long Island. While identifying and accessioning these specimens, museum scientists discovered that the Reisman Collection contained representatives of several marine species that had not been recorded in earlier lists of New York marine fishes. 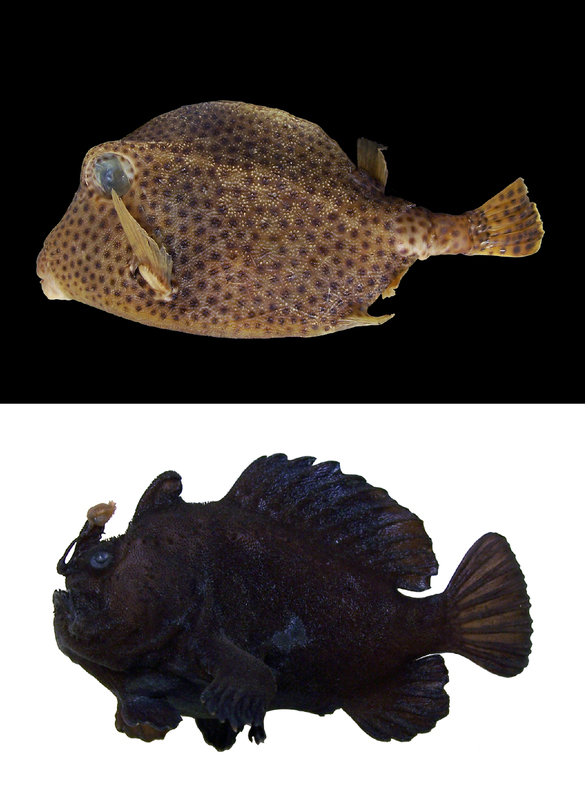 These included a species of trunkfish (Lactophrys bicaudalis, top) that has not previously been found north of Florida as well as a frogfish (Antennarius striatus, bottom) whose northernmost range was considered to be southern New Jersey. The Rock Hind (Epinephelus adscensionis) is a grouper species that was last recorded in the northeast over a hundred years ago and had never been found in New York waters. An additional species, the Whitefin Sharksucker (Echeneis neucratoides), has a very confusing taxonomic history that has led to its presence in New York (one specimen in the NYSM collection dates back to 1853) and most of the Northeast being overlooked. An article by Dr. Jeremy Wright (NYSM Curator of Ichthyology) and colleagues detailing novel New York species records from the Reisman Collection is in press at the peer-reviewed journal Northeastern Naturalist and will be published later in 2016. Posted 3-21-16: The 2016 Mohawk Watershed Symposium was held on Friday March 18th at Union College. This meeting is unique in part because of the broad scope of topics covered by the presenters. 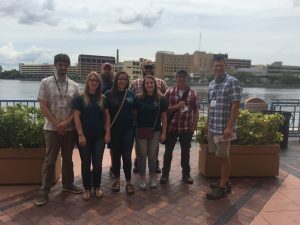 Talks and posters ranged from the effects of microplastic pollution and water-level drawdowns to water quality monitoring and the life histories of Blueback Herring. More information can be found at: 2016 Mohawk Watershed Symposium. Posted 3-3-16: A little lake-effect snow didn’t stop 55 attendees from gathering in Old Forge on March 3rd for the 2016 Adirondack Research Forum. 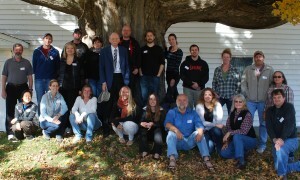 AFS Chapter members from many organizations were present including Cornell University, Syracuse University, NYSDEC, USGS, and many others. 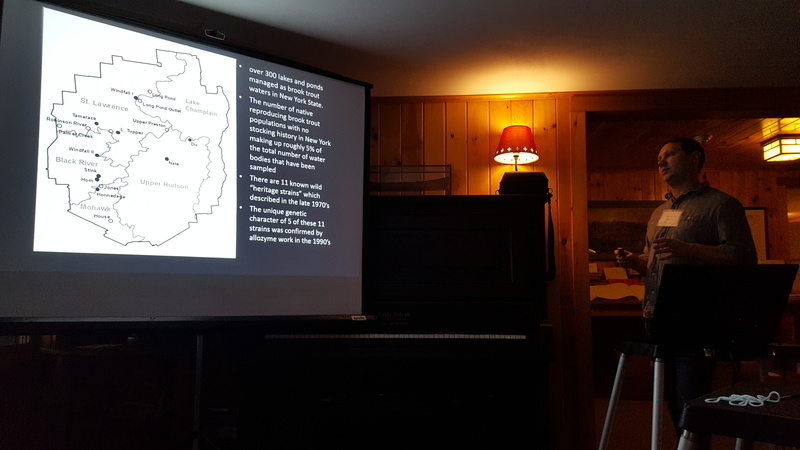 The purpose of the meeting was to discuss current research being conducted in the Adirondack Park – with a particular emphasis on fish communities and water quality. 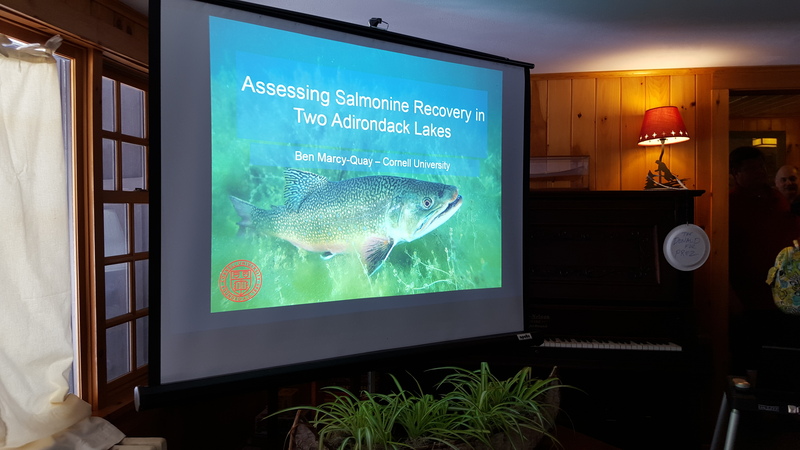 Many outstanding talks were provided on the legacy effects of acid deposition, long-term trends in mercury in concentrations in fish, genetic composition of Brook Trout populations, and other great topics. Posted 1-23-16: The Lake Champlain Chapter of Trout Unlimited will again provide scholarships for interested young men and women 11 to 17 years old to attend DEC’s popular summer camp program. The camps, located at Camp Colby, Pack Forest, DeBruce and Rushford provide a great opportunity to learn more about the environment and have fun in the summer. Campers enjoy a week of summer fun and conservation education conducted by DEC’s well-qualified counselors. The scholarships pay all costs to attend. Parents provide transportation to and from the camps for the one-week sessions which are conducted in July and August. The scholarships are a memorial to Sam Thuesen and Dennis Aprill, outstanding educators, leaders and anglers who devoted their lives to the North Country, and use private funds provided by Trout Unlimited to assist in youth conservation education. Posted 1-20-16: Environmental DNA (eDNA) analysis is rapidly evolving as a tool for monitoring the distributions of aquatic species. During 2015, Brook Trout Salvelinus fontinalis, eDNA was analyzed from waters collected at 40 streams across the Adirondack Mountains where their populations were recently quantified using electrofishing. Study objectives were to evaluate the ability of Brook Trout eDNA to accurately predict the presence and abundance of local populations. Environmental DNA results correctly inferred the presence-or-absence of Brook Trout populations in 92.5% of the study sites and explained 44% of the variability in density and 24% of the variability in biomass of local Brook Trout populations. These findings indicate that eDNA is an effective tool for characterizing the presence or absence, and the abundance of Brook Trout populations in headwater streams across the Adirondack region and elsewhere. 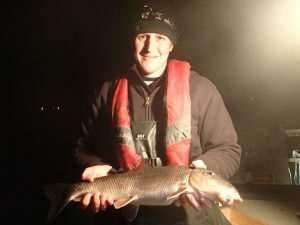 Posted 1-14-16: The ongoing effort to effectively manage the popular 2-story fishery in Otsego Lake has taken a new direction in favor of the once-abundant “Otsego Bass” (Lake Whitefish). 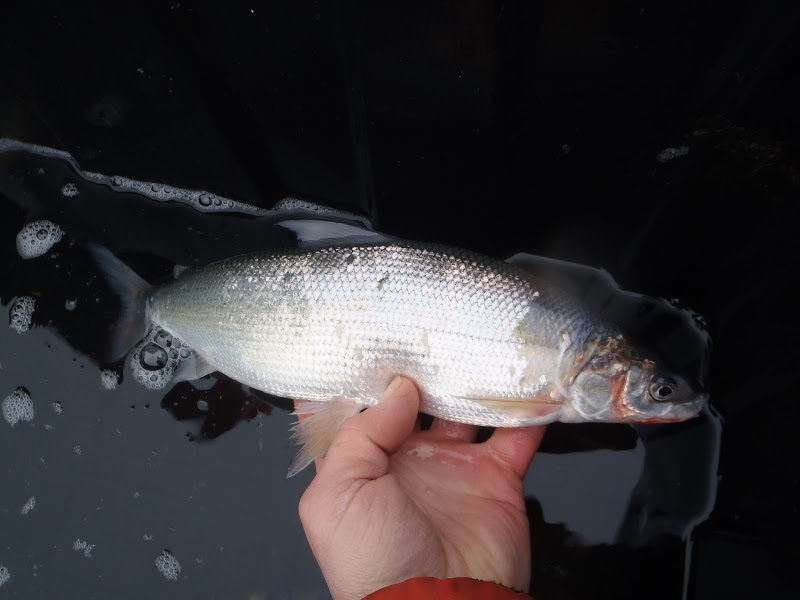 In November and December 2015, sampling teams were successful in capturing 18 adult Lake Whitefish near the north end of Otsego Lake. This late season effort is part of a long-term proposal by NYSDEC Region 4 Fisheries to support a return of this native species. Now is the time to commence this project while the invading alewife population has been suppressed by a slew of predators, allowing the zooplankton community to recover. 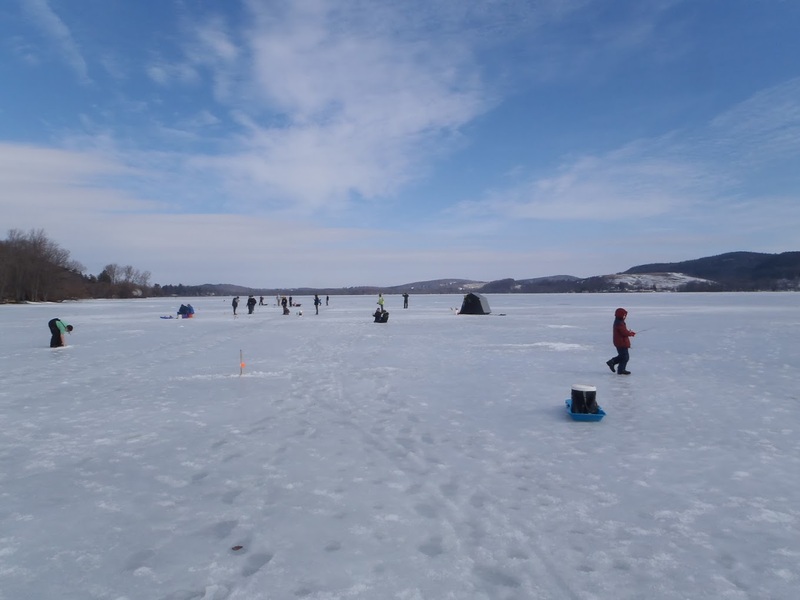 R4 Fisheries staff were assisted on the cold lake by faculty, staff, and students from both SUNY Oneonta and Cobleskill in an attempt to catch the elusive Coregonid. This was a novel survey for all involved and we learned a great deal about the species even though three weeks passed before we found a single Lake Whitefish. It was a challenge finding these fish using gill and traps nets, plus night electroshocking when conditions allowed. About 71,000 eggs were collected of which about 80% were fertilized successfully and about 35% hatched successfully. They are being cultured at the SUNY Cobleskill campus hatchery. We hope to find funding for this important part of the recovery plan as annual stockings could effectively boost Lake Whitefish numbers in the lake. Approximately 8,000 fry will be stocked in the spring of 2016 and 2,000 fingerlings will be stocked in the fall of 2016. 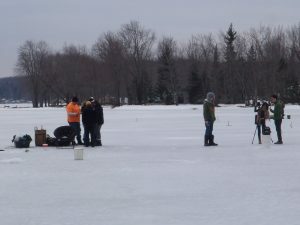 R4 Fisheries also plans to construct artificial spawning reefs in the lake during each of the next few winters to improve spawning substrate for Whitefish and Lake Trout. We expect the reefs will improve habitat for many lake species. None of this would be possible without the cooperative and enthusiastic effort by all parties. A robust “Otsego Bass” population might not only help sustain Lake Trout numbers and fitness (as a traditional forage base), but would also bring back a historical ice fishery and lakeside delicacy. Look for upcoming AFS posters and other products regarding this recovery effort. Posted 11-10-15: On October 15th Region 9 fisheries staff and the Randolph Fish Hatchery stocked approximately 1500, age 1+ Northern Longear Sunfish in Ellicott Creek and Cayuga Creek. Northern Longear Sunfish are abundant across the upper Midwest but are threatened in New York State. They were historically found in six watersheds in Western and Central New York. However, by 2000 they could only be found in Tonawanda Creek. In 2005 a stocking program was initiated to re-introduce the species back into its historic range in NY. The program propagated three strains of fish; Michigan strain (Huron River), Ontario strain (Moira River) and New York strain (Tonawanda Creek). Approximately 22,000 Northern Longear Sunfish have been stocked in 12 waters in New York since 2006. Posted 11-10-15: The Cornell Biological Field Station on Oneida Lake hosted a PRIMER statistical workshop on Nov 2-6, 2015. The workshop was led by PRIMER creator Bob Clarke who unveiled a number of new nonparametric, permutation-based methods for analyzing community data. Participants travelled from as far as Chile and Canada while many USFWS, USGS, and Cornell folks attended as well. Thank you to Bob and the staff at the Cornell Field Station for a great week! Posted 11-4-15: The second of a 10-year lake sturgeon stocking effort led by the New York State Department of Environmental Conservation (NYSDEC) is in the books. 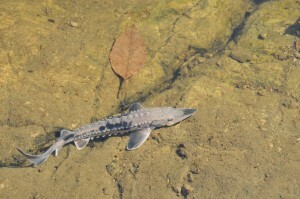 On October 8, 10,500 young lake sturgeon raised at the U.S. 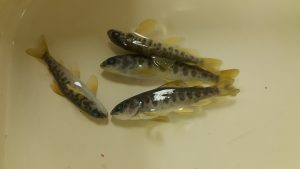 Fish and Wildlife Service (USFWS) – Genoa National Fish Hatchery in Wisconsin returned to New York where they were collected as eggs in early June. In 2015, USFWS and NYSDEC staff released a total of 20,500 sturgeon into various water bodies throughout Northern New York. The state restoration effort is made possible in collaboration with the USFWS, the St. Regis Mohawk Tribe, the New York Power Authority, and the U.S. Geological Survey. This ongoing project is funded in part by the USFWS-New York Field Office thorough the Fish Enhancement, Mitigation, and Research Fund (FEMRF). Photo credit to USFWS. Posted 10-16-15: The U.S. Fish and Wildlife Service recently determined that American Eel populations are stable and do not warrant protection under the Endangered Species Act at this time. This is the second time the Service has evaluated the American eel for listing under the ESA and found listing not warrented. Additional information on this decision can be found at the press release here and a comprehensive species report is available here. Posted 10-7-15: Phil Hulbert recently received the National Trout Unlimited Award for Conservation Professional of the year award at the recent convention in Scranton, PA. Phil has served the ideals of Trout Unlimited since his beginnings in the DEC in 1977. Phil has always brought his voice to TU to his colleagues and provided NY TU volunteers with counsel and guidance on the resources. He has also extended the Trout in the Classroom program at TU with his assistance to educate school kids in the program and adherence to the program as an educational component in classrooms across NY. Perhaps his greatest efforts are to help preserve and protect native brook trout earning many TU members with high regards for his dedication in the cold water resources. Phil’s cooperative efforts with the 32 NY chapters of TU council have also helped classify miles upon miles of unknown streams, affording them special protections under New York stream regulations. 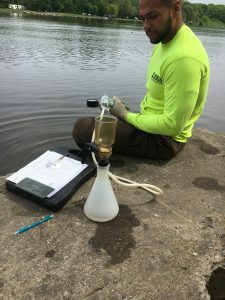 Prior to working with DEC Phil received his BA and MS degrees from the University of Maine at Orono and conducted Atlantic salmon restoration work in the Penobscot River system. His career with DEC began in in 1977. He has served in the Division of Fish and Wildlife as a Biologist, Coldwater Fisheries Unit Leader, Superintendent of Fish Culture, and Chief of the Bureau of Fisheries. Areas of particular involvement have included assessment of angling regulations, DEC’s catch rate oriented trout stream stocking methodology (CROTS), sea lamprey control, Delaware River tailwater studies, whirling disease investigations, novel approaches to reducing phosphorus discharges from fish hatcheries, and identification of heritage strains of brook trout. Most recently, he led an inter-disciplinary team of DEC staff in updating the Statewide Aquatic Invasive Species Management Plan. Posted 9-2-15: Through the use of eel mops and electrofishing, a team of researchers from the Wildlife Conservation Society, Queens College, The Bronx River Alliance, other organizations, and myself have been sampling different sections of the Bronx River for American Eels. American eel populations have been experiencing a decline due to overfishing and loss of habitat. A great portion of habitat loss is due to the extensive damming of rivers, so our study focused on the many barriers of the Bronx River. 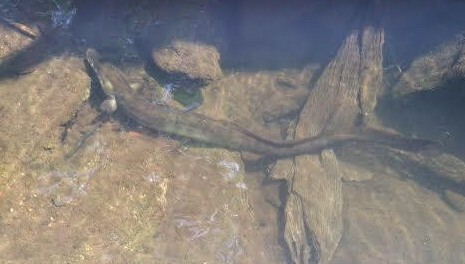 Since American eels are catadromous (spend their lives maturing upstream in rivers and returning to the sea to spawn), access to upstream sections of rivers is very important to eel migration patterns. 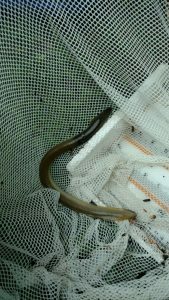 We have sampled seven of the nine major barriers in the Bronx River, catching eels as small as 6cm all the way up to 87.6cm long. After being captured, eels are anesthetized, measured, and implanted with a PIT tag. These PIT tags act as an identification number for each eel so that we can track the movement of eels upon recapture. The goal of this research is to gain a better understanding of how the American eel population is distributed throughout the different reaches of the Bronx River, and support the installation of eel passages at each barrier. Posted 9-2-15: In a recent visit to Kayaderosseras Creek (Saratoga County, NY), we unexpectedly discovered a previously undocumented population of Magaritifera magaritifera, the eastern pearlshell. 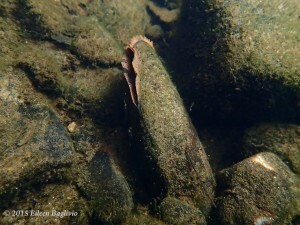 This native freshwater mussel is unique because it prefers soft waters and uses salmonids as obligate hosts for its larvae. Forty six individuals were observed within a 130 meter reach of stream. Mussel lengths ranged in size from 50 mm to 145 mm, indicating multiple year classes and relatively recent reproduction. This is the first population of M. margaritiera documented in this region (upper Hudson River drainage) of New York State and one of only a few populations reported in the state in the last 40 years. The discovery of this population reflects the need for further documentation of freshwater mussel species distribution and abundance in New York State. Posted 9-2-15: The American brook lamprey is a small, non-parasitic lamprey species endemic to New York, and common in some drainages (especially the upper Genesee River). Brook lampreys, unlike their cousin, the larger and far ranging sea lamprey, are assumed to be limited in their movement during their larval stage. However, no one has yet tested whether this is the case. Using a tributary of the Genesee River, long term monitoring of American brook lamprey is testing this assumption. Tagging with visible implant elastomer was begun in June 2014 and will be completed in October 2015. Initial findings suggest that American brook lamprey are restricted in their movement. For instance, some animals were recaptured in the same location they were left after 1 year! Posted 8-31-15: The Rainbow Darter, a small, colorful fish species that is native to the Allegheny River watershed in southeastern New York, was first discovered at several sites in Fox Creek, in the Schoharie Creek drainage basin, in 2009. No further occurrences were reported until the Spring of 2013, when New York State Museum scientists discovered specimens at several sites in the Switzkill, a tributary to Fox Creek. As a result, the Museum has undertaken surveys within the Schoharie Creek Basin and the Mohawk River watershed as a whole, to examine the rate and extent of this invasive species’ spread. We have documented the presence of high population densities of Rainbow Darters at numerous sites within Schoharie Creek and several of its tributaries, as well as in direct tributaries to the Mohawk River as far east as the Plotter Kill, just NW of Schenectady. Surveys continue to further refine our knowledge of this darter’s distribution and numbers within the watershed and possible barriers to its dispersal. Studies utilizing both the results of recent surveys and museum collections dating before the introduction of the Rainbow Darter to the basin, along with direct examination of the stomach contents of multiple species, will shed light on the impact of this darter on native fish species as a possible result of interspecific competition for various habitat resources. 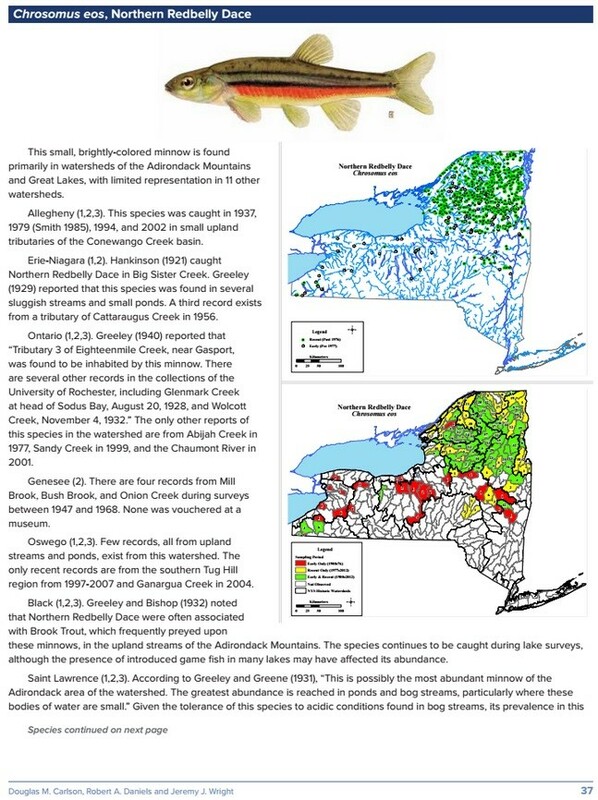 Posted 8-18-15: The New York State Museum has been collecting brook trout fin clips in watersheds State-wide for genetic analysis over the course of the past two years, collaborating with various government agencies and organizations throughout the State. 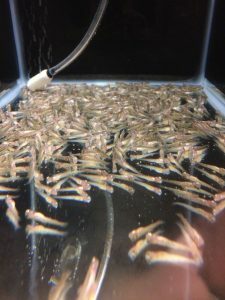 The primary goals of the study are to assess the population genetics of wild fish in the state, determine the level of influence hatchery fish have had on wild populations, and identify the remaining non-introgressed native populations present in our waters. Preliminary analysis suggests that the influence of hatchery fish is less pronounced in larger watersheds with extensive tributary networks, and significant differences in genetic structure exist both at the individual watershed level, as well as across major drainage basins. The resulting work is expected to shed light on the phylogeographic distribution of brook trout throughout the State, as well as offer diversity measures to aid managers in determining what populations may make good brood-stocks, and what populations may benefit from the introduction of migrants via supplemental stocking. Posted 6-12-15: Staff from the USGS NY Water Science Center in Troy and NYS Department of Environmental Conservation Region 4 fisheries staff conducted fish community surveys at 12 sites on the Mohawk River/Barge Canal between May 26th and June 3rd using boat electrofishing of near shore habitats. 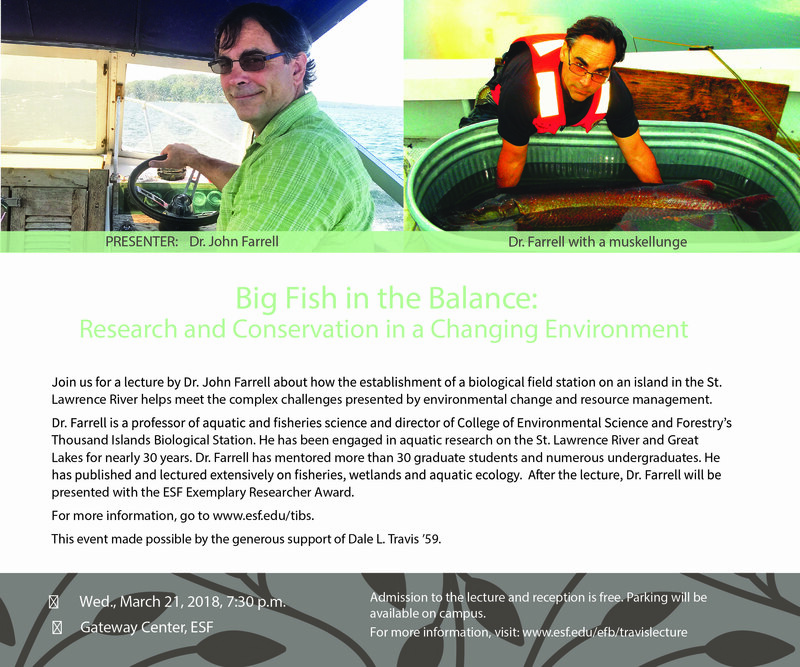 The primary goals of the study are to compare fish communities between river sections in which water levels are managed differently and to compare contemporary fish communities with those sampled from the early 1980s during the last comprehensive river-wide study. 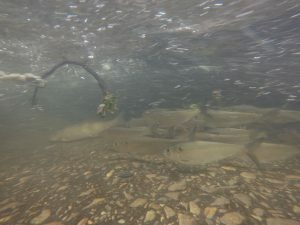 A preliminary look at the data suggests that lentic species are less abundant in river sections which experience larger winter drawdowns but statistical analyses will be conducted to confirm or refute these observations. 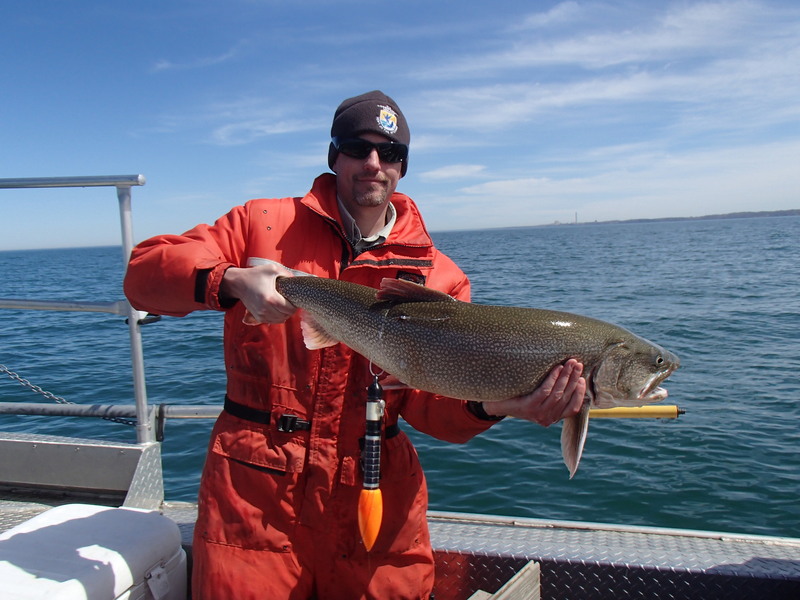 Posted 4-21-15: On April 13th and 14th the US Fish and Wildlife Service’s Lower Great Lakes Fish and Wildlife Conservation office collected Lake Trout from Lake Ontario for a new study they are doing. They caught and released 42 lake trout of which 18 were tagged with Pop-off Satellite Archival Tags (PSAT). The tags are neutrally buoyant and will release themselves from the fish after one year. The tags will monitor the temperature and depth of the fish as well as take light and magnetic field measurements to estimate location in the lake at a course scale (>10 km). The tags are equipped with a solar panel so anytime the tag reaches the surface it will recharge the batteries and send a GPS signal and data. The tags are programmed to record lots of data but can only transmit a portion of that data to the satellites so the biologists are hoping for a high recovery rate. If these tags are found return information is on the tags and the office can either pick them up or provide packaging and shipping costs to return them. Any and all help will be appreciated greatly. Posted 4-21-15: I’m pleased to announce that the newsletter for the NYC AFS will have a new format. Important news on workshops, meetings, trainings, etc. will now be housed on other parts of our new chapter website, and the newsletter itself will be structured like a science blog. My vision for the blog is to communicate information on new studies, findings, publications, etc. that are relevant to our membership as quickly as possible. Please email me submissions ([email protected]) with 1-2 paragraphs of text and a couple photos or figures. No submission is too small and you can send me as many submissions as you’d like. Thanks for helping make this an important channel for communicating fisheries news in New York State!